Steven A. Camarota is the director of research and Karen Zeigler is a demographer at the Center for Immigration Studies. Data from the Census Bureau shows that 42.4 million immigrants (both legal and illegal) now live in the United States. This Backgrounder provides a detailed picture of immigrants, also referred to as the foreign-born, living in the United States by country of birth and state. It also examines the progress immigrants make over time. All figures are for both legal and illegal immigrants who responded to Census Bureau surveys. The nation's 42.4 million immigrants (legal and illegal) in 2014 is the highest number ever in American history. The 13.3 percent of the nation's population comprised of immigrants in 2014 is the highest percentage in 94 years. Between 2000 and 2014, 18.7 million new immigrants (legal and illegal) settled in the United States. Despite the Great Recession beginning at the end of 2007, and the weak recovery that followed, 7.9 million new immigrants settled in the United States from the beginning of 2008 to mid-2014. From 2010 to 2014, new immigration (legal and illegal) plus births to immigrants added 8.3 million residents to the country, equal to 87 percent of total U.S. population growth. The sending countries with the largest percentage increases in immigrants living in the United States from 2010 to 2014 were Saudi Arabia (up 93 percent), Bangladesh (up 37 percent), Iraq (up 36 percent), Egypt (up 25 percent), and Pakistan, India, and Ethiopia (each up 24 percent). States with the largest percentage increases in the number of immigrants from 2010 to 2014 were North Dakota (up 45 percent), Wyoming (up 42 percent), Montana (up 19 percent), Kentucky (up 15 percent), New Hampshire (up 14 percent), and Minnesota and West Virginia (both up 13 percent). Rates of work for immigrants and natives tend to be similar — 70 percent of both immigrants and natives (ages 18 to 65) held a job in March 2015. Immigrant men have higher rates of work than native-born men — 82 percent vs. 73 percent. However, immigrant women have lower rates of work than native-born women — 57 percent vs. 66 percent. A large share of immigrants have low levels of formal education. Of adult immigrants (ages 25 to 65), 28 percent have not completed high school, compared to 8 percent of natives. The share of immigrants (25 to 65) with at least a bachelor's degree is only slightly lower than natives — 30 percent vs. 32 percent. Because many immigrants have modest levels of education, they have significantly increased the share of some types of workers relative to others. In 2014, 49 percent of maids, 47 percent of taxi drivers and chauffeurs, 33 percent of butchers and meat processors, and 35 percent of construction laborers were foreign-born. While the above occupations are often thought of as overwhelmingly comprised of immigrants, most of the workers in these jobs are U.S.-born. Workers in other occupations face relatively little competition from immigrants. In 2014, 5 percent of English language journalists, 6 percent of farmers and ranchers, and 7 percent of lawyers were immigrants. At the same time immigration has added to the number of less-educated workers, the share of young less-educated natives holding a job declined significantly. In 2000, 66 percent of natives under age 30 with no education beyond high school were working; in 2015 it was 53 percent. Despite similar rates of work, because a larger share of adult immigrants arrive with little education, immigrants are significantly more likely to work low-wage jobs, live in poverty, lack health insurance, use welfare, and have lower rates of home ownership. In 2014, 21 percent of immigrants and their U.S.-born children (under 18) lived in poverty, compared to 13 percent of natives and their children. Immigrants and their children account for about one-fourth of all persons in poverty. Almost one in three children (under age 18) in poverty have immigrant fathers. In 2014, 18 percent of immigrants and their U.S.-born children (under 18) lacked health insurance, compared to 9 percent of natives and their children. In 2014, 42 percent of immigrant-headed households used at least one welfare program (primarily food assistance and Medicaid), compared to 27 percent for natives. Both figures represent an undercount. If adjusted for undercount based on other Census Bureau data, the rate would be 57 percent for immigrants and 34 percent for natives. In 2014, 12 percent of immigrant households were overcrowded, using a common definition of such households. This compares to 2 percent of native households. Of immigrant households, 51 percent are owner-occupied, compared to 65 percent of native households. The lower socio-economic status of immigrants is not due to their being mostly recent arrivals. The average immigrant in 2014 had lived in the United States for almost 21 years. Immigrants make significant progress the longer they live in the country. However, even immigrants who have lived in the United States for 20 years have not come close to closing the gap with natives. The poverty rate of adult immigrants who have lived in the United States for 20 years is 57 percent higher than for adult natives. The share of households headed by an immigrant who has lived in the United States for 20 years using at least one welfare program is 80 percent higher than native households. The share of households headed by an immigrant who has lived in the United States for 20 years that are owner occupied is 24 percent lower than that of native households. There are 10.9 million students from immigrant households in public schools, and they account for nearly 23 percent of all public school students. There are 64 public school students per 100 immigrant households, compared to 38 for native households. Because immigrant households tend to be poorer, immigration often increases school enrollment without a corresponding increase in the local tax base. In addition to increasing enrollment, immigration often creates significant challenges for schools by adding to the number of students with special needs. In 2014, 75 percent of students who spoke a language other than English were from immigrant households, as are 31 percent of all public school students in poverty. States with the largest share of public school students from immigrant households are California (47 percent), Nevada (37 percent), New York and New Jersey (33 percent each), and Texas (32 percent). Immigrants and natives have very similar rates of entrepreneurship — 12.4 percent of immigrants are self-employed either full- or part-time, as are 12.8 percent of natives. Most of the businesses operated by immigrants and natives tend to be small. In 2015, only 16 percent of immigrant-owned businesses had more than 10 employees, as did 19 percent of native-owned businesses. Recent immigration has had a small impact on the nation's age structure. If post-2000 immigrants are excluded from the data, the median age in the United States would still be 37. Recent immigration has had a small impact on the nation's fertility rate. In 2014, the nation's total fertility rate (TFR) was 1.85 children per women. Excluding all immigrants, it would have been the rate for natives — 1.78 children per woman. The presence of immigrants has increased the nation's TFR by about 4 percent. Immigration policy determines the number allowed in, the selection criteria used to admit them, and the level of resources devoted to controlling illegal immigration. The future, of course, is not set and when deciding on what immigration policy should be it is critically important to know the impact of immigration in recent decades. There is no single approach to answering the question of whether the country has been well served by its immigration policy. Although not explicitly acknowledged, the two most important ways of examining the immigration issue are what might be called the "immigrant-centric" approach and the "national" approach. They are not mutually exclusive, but they are distinct. The immigrant-centric approach focuses on how immigrants are faring, or what is sometimes called immigrant adaptation or assimilation. The key assumption underlying this perspective is not so much how immigrants are doing relative to natives, but rather how they are doing given their level of education, language skills, and other aspects of their human capital endowment. This approach also tends to emphasize the progress immigrants make over time on its own terms, and the benefit of migration to the immigrants themselves. The immigrant-centric view is the way most, but by no means all, academic researchers approach the issue. The other way of thinking about immigration can be called the national perspective, which is focused on the impact immigration is having on American society. This approach implicitly assumes that immigration is supposed to benefit the existing population of American citizens; the benefit immigrants receive by coming here is less important. So, for example, if immigration adds significantly to the population in poverty or using welfare programs, this is seen as a problem, even if immigrants are clearly better off in this country than they would have been back home and are no worse off than natives with the same education. This approach is also focused on possible job competition between immigrants and natives and the effect immigration has on public coffers. In general, the national perspective is the way the American public thinks about the immigration issue. When thinking about the information presented in this report, it is helpful to keep both perspectives in mind. There is no one best way to think about immigration. By approaching the issue from both points of view, the reader may arrive at a better understanding of the complex issues surround immigration. Data Sources. The data for this Backgrounder comes primarily from the 2014 American Community Survey (ACS) and the March 2015 Current Population Survey (CPS). In some cases, for state-specific information we combine the March 2014 and 2015 CPS to get a larger, more statistically robust sample. The 3/8 file of the March 2014 CPS was chosen as this is compatible with the March 2015 CPS for income and poverty statistics.2 The ACS and CPS have become the two most important sources of data on the size, growth, and socio-economic characteristics of the nation's immigrant population. In this report, the terms foreign-born and immigrant are used synonymously. Immigrants are persons living in the United States who were not American citizens at birth. This includes naturalized American citizens, legal permanent residents (green card holders), illegal aliens, and people on long-term temporary visas, such as foreign students or guestworkers, who respond to the ACS or CPS.3 We use the terms illegal alien and illegal immigrant interchangeability. The 2014 and 2015 March CPS files were downloaded from the Data Ferret website provided by the Census Bureau. Historical files in Figure 2 (2000-2013) were downloaded from IPUMS. The public-use sample of the 2014 ACS used in this study has roughly 3.1 million respondents, nearly 360,000 of whom are immigrants. It is by far the largest survey conducted by the U.S. Census Bureau. The ACS includes all persons in the United States, including those in institutions such as prisons and nursing homes. Because of its size and it more complete coverage of the total population, we use the ACS in this report for the overall number of immigrants and their year of arrival at the national and state level. Because it includes questions on language and public school enrollment not found in the CPS, we also use the ACS to examine these issues. Although the ACS is an invaluable source of information on the foreign-born, it contains fewer questions than the CPS. The 2014 ACS file was downloaded from IPUMS. The March Current Population Survey, which is called the Annual Social and Economic Supplement, includes an extra-large sample of minorities. The survey is abbreviated as the CPS ASEC or just the ASEC. While much smaller than the ACS, the CPS ASEC still includes about 200,000 individuals, more than 26,000 of whom are foreign-born. Because the CPS contains more questions, it allows for more detailed analysis in some areas than the ACS. The CPS has been in operation much longer than the ACS and for many years it has been the primary source of data on the labor market characteristics, income, health insurance coverage, and welfare use of the American population. The CPS is also one of the only government surveys to include questions on the birthplace of each respondent's parent, allowing for generational analysis of immigrants and the descendants of immigrants. Another advantage of the CPS, unlike the ACS, is that every household in the survey receives an interview (phone or in-person) from a Census Bureau employee.4 Like the ACS, the CPS is weighted to reflect the actual size of the total U.S. population. Unlike the ACS, the CPS does not include those in institutions and so does not cover the nation's entire population. However, those in institutions are generally not part of the labor market, nor are they typically included in statistics on health insurance coverage, poverty, income, and welfare use. Immigration has clearly played an important role in American history. 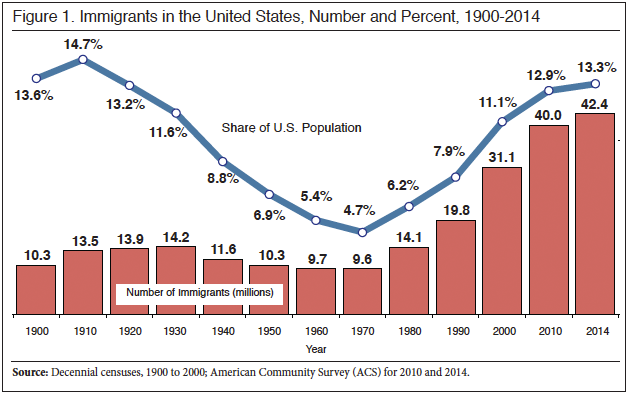 Figure 1 reports the number and percentage of immigrants living in the United States from 1900 to 2014. The figure shows very significant growth in the foreign-born both in absolute numbers and as a share of the total population since 1970. The immigrant population in 2014 stood at 42.4 million in the ACS. The Department of Homeland Security estimates that 1.85 million immigrants are missed in the ACS. 6 So the actual number of immigrants may have been 44.25 million in 2014. Even without accounting for those missed by the Census Bureau, it is still the case that the foreign-born population in 2014 has more than doubled since 1990, tripled since 1980, and quadrupled since 1970, when it stood at 9.6 million. The increase in the size of the immigrant population has been so dramatic (22.6 million) since 1990 that just this growth is double the size of the entire foreign-born population in 1970 or even 1900. In terms of the impact of immigrants on the United States, both the percentage of the population made up of immigrants and the number of immigrants are clearly important. The ability to assimilate and incorporate immigrants is partly dependent on the relative sizes of the native and immigrant populations. On the other hand, absolute numbers also clearly matter; a large number of immigrants could create the critical mass necessary to foster linguistic and cultural isolation regardless of their percentage of the overall population. Whether one focuses on numbers or population share, the growth of the foreign-born population in recent decades is extraordinary and the latest projections indicate that the country is headed into uncharted territory. Total Numbers. 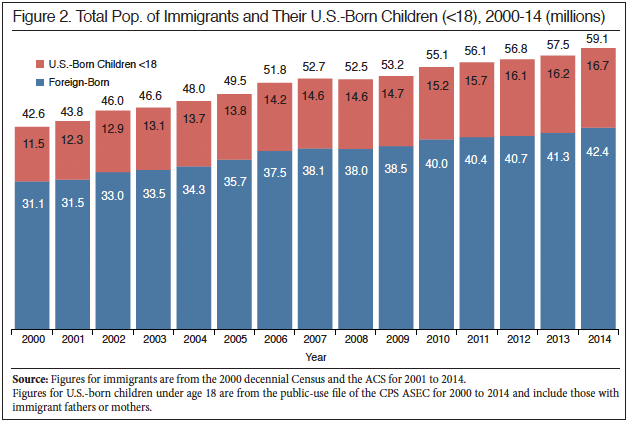 Figure 2 reports the size of the foreign-born population from 2000 to 2014 based on the ACS and the number of children (<18) with immigrant fathers or mothers based on the CPS.8 The figure shows significant growth during the last 14 years. Figure 2 shows a significant fall-off in the growth of the immigrant population from 2007 to 2009, with an increase of only 450,000 over that two-year period. This slowing in the growth likely reflects a reduction in the number of new immigrants (legal and illegal) settling in the country and an increase in out-migration. The deterioration in the U.S. economy coupled with stepped-up enforcement efforts at the end of the Bush administration almost certainly accounts for much of this decline. In a series of reports looking that this time period, the Center for Immigration Studies estimated immigration and emigration rates throughout the decade. In general, our prior research found good evidence that the level of new immigration fell at the end of the decade and that out-migration increased.9 Since 2012, growth in the foreign-born population has picked up, increasing by 1.7 million in the two years prior to 2014. Figure 2 also shows that the number of U.S.-born children of immigrants under age 18 has also increased significantly. Flow of New Immigrants. Another way to examine trends in immigration is to look at responses to the year-of-arrival question. Figure 3 reports new arrivals based on the ACS from 2000 to 2014. (The ACS for each year provides complete arrival data for the preceding calendar year, so, for example, arrival figures for 2013 are from the 2014 ACS and the figures for 2012 are from the 2013 ACS.) Data for 2014 is only for the first six months of that year, as the ACS reflects the U.S. population as of July 1. Figure 3 also reports the unemployment rate for immigrants during the same time period. The figure indicates that the number of new arrivals was higher in the first part of the decade relative to the end of the decade. But the key finding is that immigration remained very high, even when immigrant unemployment increased dramatically. Over the entire period 2000 to 2014, 18.7 million new immigrants arrived. Figure 3 also shows that, despite the Great Recession, which began at the end of 2007, and the weak economic growth that followed it, 7.9 million new immigrants still settled in the United States from the beginning of 2008 to mid-2014. This is an enormous flow of new people entering the country during a steep recession and relatively weak recovery. During the very worst of the economic downturn, 2008 to 2011, Figure 3 still shows 4.5 million new immigrants settled in the country. The results in Figure 3 are a reminder that immigration is a complex process; it is not simply a function of labor-market conditions in the United States. While the state of the U.S. economy can impact the pace of immigration, the desire to be with relatives or to enjoy greater political freedom and lower levels of official corruption also play a significant role in the decision to come to the United States. The generosity of America's public benefits and the quality of public services also make this country an attractive place to settle. These things do not change during a recession, even a steep one. Figure 3 also shows an increase in new arrivals 2011 to 2013. This fact, and the increase in growth 2012 to 2014 already discussed in Figure 2, supports the idea that immigration maybe rebounding — with more immigrants arriving and perhaps fewer returning home each year. Mortality Among the Foreign-Born. By definition, no one born in the United States is foreign-born and so births cannot add to the immigrant population. Moreover, each year some immigrants die and others return home. There is some debate about the size of out-migration, but together deaths and return-migration should equal about 1.5 percent of the immigrant population annually, or roughly 600,000 a year. (Note that this estimate of deaths and out-migration applies to the entire foreign-born population, not just new arrivals.) For the foreign-born population to grow, new immigration must exceed deaths and outmigration. It is possible to estimate deaths and outmigration based on the ACS data. Given the age, gender, race, and ethnic composition of the foreign-born population, the death rate over the last decade should be about seven per 1,000. (These figures include only individuals living in the United States and captured by the ACS, not any deaths that occur among illegal immigrants trying to cross the border illegally.) This means that the number of deaths 2010 to 2014 was 1.15 million, or an average of 288,000 deaths per year. Net Immigration. Figure 3 shows that new immigration was 5.58 million from 2010 to 2014. However, these figures are for all of 2010 while the growth figures (2.44 million) are from July 1, 2010, to July 1, 2014. Excluding one-half of the new arrivals in 2010 so that arrivals correspond to the growth figures means new immigration from July to July equaled five million. Out-migration can be estimated using the following formula: outmigration = new arrivals – (growth + deaths). Plugging in the numbers we get the following: 1.41 million = 5 million – (2.44 million + 1.15 million). This implies 1.41 million immigrants left the United States during the four years from 2010 to 2014, or about 350,000 annually. Demographers often use the term "net immigration" to describe the difference between new arrivals and those leaving. Based on the above calculations, net immigration was 3.59 million from 2010 to 2014. To estimate net immigration, we subtract new arrivals (five million) from emigration (1.41 million) for net immigration of 3.59 million since 2010. It should be noted that emigration occurs among the entire immigrant population, not just among new arrivals. In fact, most of those leaving the country 2010 to 2014 arrived years earlier. There are several caveats about these numbers. First, the estimates are for a four-year period and outmigration may have varied from year to year. Second, there is no adjustment for undercount in these numbers, which is not trivial among new arrivals. Third, this approach assumes that growth in the foreign-born population can only be caused by those who report that they are new entrants. In fact, growth can be caused by immigrants returning to the United States after spending time outside of the country. It is not clear what year these returning immigrants will report when asked by the Census Bureau what year they "came to live in the United States".11 Despite these possible sources of error, the level of out-migration and net immigration reported above provides a reasonable estimate of the flow of people into and out of our country. State Data. Table 1 shows the number of immigrants in each state and the share that is immigrant in 2014. California, Texas, New York, Florida, New Jersey, Illinois, Massachusetts, Virginia, Georgia, Washington, Arizona, Maryland, and Pennsylvania have the largest immigrant populations. Each of these states had more than 800,000 foreign-born residents in 2014. California has the largest immigrant population, accounting for one-fourth of the national total. New York and Texas are next with over 10 percent of the nation's immigrants. With 9 percent of the nation's immigrants, Florida's foreign-born population is similar in size. New Jersey and Illinois are next with 5 and 4 percent of the nation's immigrants, respectively. Table 1 shows that the immigrant population is concentrated in relatively few states. Six states account for 64 percent of the nation's foreign-born population, but only 40 percent of the nation's overall population. Table 1 also reports year of arrival for the foreign-born population in each state in 2014. In 2014, there were 5.2 million immigrants who indicated they had arrived in the United States in 2010 or later. As already discussed, the actual number of new arrivals 2010 to 2014 was higher, but some who came in this period went home or died over this time. Table 1 shows that the average immigrant has lived in the United States for almost 21 years.12 Thus the immigrant population in the United States is comprised mostly of long-time residents. This is important: As will become clear in this report, immigrants have much higher rates of poverty, uninsurance, and welfare use and lower incomes and rates of home ownership. However, the economic status of the immigrant population is not because they are mostly new arrivals. Looking at the immigrant share of each state's population shows that in general many of the states with the largest immigrant populations are also those with the highest foreign-born shares. However, several smaller states such as Hawaii and Nevada rank high in terms of the percentage of their populations that is foreign-born, even though the overall number of immigrants is more modest relative to larger states. 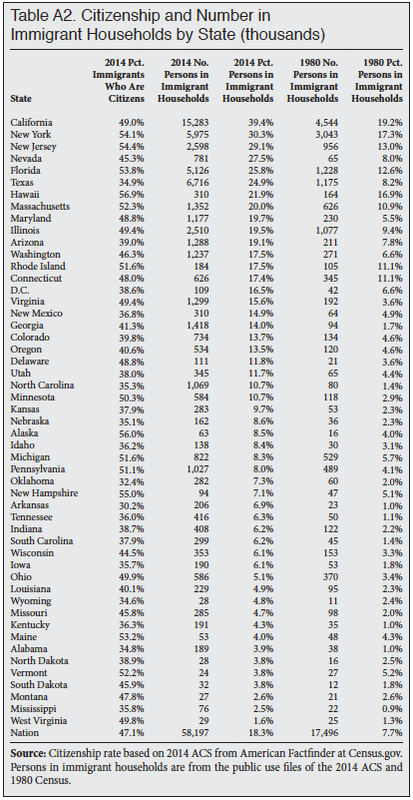 Table A.1 in the appendix at the end of this report shows the immigrant share of each state's population from 1980 to 2014. 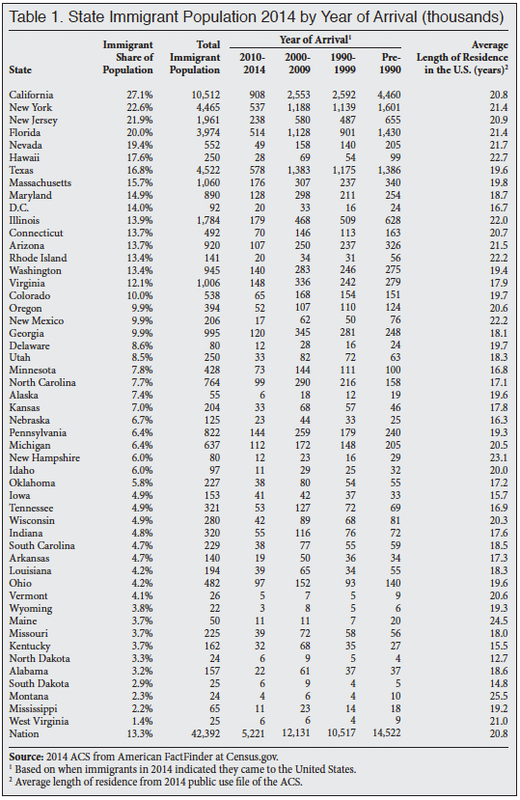 Table A.2 in the appendix shows citizenship rates and the number of persons in immigrant households by state. In addition to total numbers, Table 1 shows the immigrant populations by state based on their year of arrival, grouped by decade. Table 2 reports the size of state immigrant populations in 2014, 2010, 2000, and 1990. While the immigrant population remains concentrated, it has become less so over time. In 1990, California accounted for 33 percent of the foreign-born, but by 2000 it was 28 percent and by 2014 it was 25 percent of the total. If we look at the top six states of immigrant settlement, they accounted for 73 percent of the total foreign-born in 1990, 68 percent in 2000, and 64 percent in 2014. Table 2 also shows there were nine states (10 if we count the District of Columbia) where the growth in the immigrant population was more than twice the national average of 6 percent over the last four years. These states were North Dakota (45 percent), Wyoming (42 percent), Montana (19 percent), Kentucky (15 percent), New Hampshire (14 percent), Minnesota and West Virginia (both 13 percent), and Louisiana and Utah (both 12 percent). It is worth noting that the growth rate in California, the state with the largest immigrant population growth, was about 4 percent, lower than the national average. Table 2 makes clear that the nation's immigrant population has grown very dramatically outside of traditional areas of immigrant settlement like California. Tables 3, 4, and 5 report immigrant figures in 2014 by region and country of birth and the year they came to the United States.13 Table 3 shows regions of the world by year of arrival, with Mexico and Canada reported separately.14 Latin America accounts for almost 52 percent of immigrants overall. In terms of the number of post-2010 immigrants, 37 percent of those who came 2010 to 2014 are from Latin America (Mexico, Central America, South America and the Caribbean). Table 4 reports the top immigrant-sending countries in 2014. In terms of sending the most immigrants 2010 to 2014, Mexico, India, China, the Philippines, Cuba, the Dominican Republic, and Vietnam were the top countries. Table 4 also reports the number of immigrants from each country who arrived in 2010 or later. Thus, the table reads as follows: 5.9 percent of Mexican immigrants in 2014 indicated in the survey that they arrived in 2010 or later. For immigrants from Saudi Arabia, 72 percent arrived in 2010 or later. Countries such as Nepal (43 percent), Iraq (41 percent), Burma (35 percent), and Spain (30 percent) had higher percentages of recent arrivals. In contrast, for countries like Poland and Laos, few are recent arrivals. Table 5 shows the top sending countries in 2014 and those same countries in 2010, 2000, and 1990. Table 5 shows that, among the top sending countries, those with the largest percentage increase in their immigrant populations in the United States from 2010 to 2014 were Saudi Arabia (93 percent), Bangladesh (37 percent), Iraq (36 percent), Egypt (25 percent), and Pakistan, India, and Ethiopia (all 24 percent). This compares to an overall growth rate of 6 percent during the time period. Because arrival numbers from the ACS are for January 1, 2010, to July 2014, we adjusted new arrivals by subtracting half of those who arrived in 2010 from this total so that new arrivals from mid-2010 to mid-2014 total 4.7 million and comport with the period of time that is measured by population growth figures. Of course, immigrants do not just add to the population by their presence in the United States. Based on the 2014 ACS, there were 3.6 million births to immigrants in the United States over the last four years.16 The top of Table 6 adds the 4.7 million new arrivals to the 3.6 million births for a total of 8.3 million additions to the U.S. population from immigration. This equals 87.4 percent of U.S. population growth from July 2010 to July 2014. Not all births during the decade to immigrants where to those who arrived 2010 to 2014. Method 2 reports that of the 3.6 million births during the decade, just 206,258 were to immigrants who arrived during the time period. (Not surprisingly, most births were to immigrants who arrived before 2010.) If we add those born to new arrivals to the number of new entrants, we get 4.9 million additions to the U.S. population, or 51.6 percent of population growth. The lower part of Table 6 uses net immigration instead of new arrivals to estimate the impact of immigration on population growth. As discussed in the section on deaths and outmigration, our rough estimate is that net immigration from 2010 to 2014 was 3.6 million. This is the difference in the number arriving and the number leaving. If we add net immigration to total immigrant births during the decade it equals 7.2 million, or 75.7 percent of population growth, as shown in Method 4. Method 5 uses net immigration and the number of births to new immigrants for a total addition of 3.8 million, which equals 39.9 percent of population growth. Net immigration by itself equals 37.7 percent of population growth, as shown in Method 6. 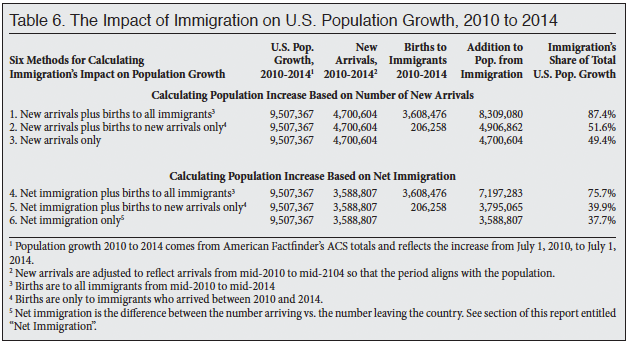 It may be worth noting that growth in the immigrant population of roughly 2.4 million (see Figure 1) is not an accurate way of assessing the impact of immigration policy on population size because it includes deaths that are not a function of policy and are not connected with new arrivals.17 Table 6 makes clear that whether new immigration or net immigration is used to estimate the impact, immigration policy has very significant implications for U.S. population growth. The same data used in Table 6 not only provides an estimate of immigration's impact on population growth, it has other uses as well. For example, if we wished to allow the current level of immigration, but still wished to stabilize the U.S. population by reducing native fertility, we can roughly estimate what it would take based on the table. In 2014, there were about 15.4 million children living in the country who were born to natives 2010 to 2014. As shown above, immigration added 8.3 million to the U.S. population. To offset these additions, it would have required 8.3 million fewer births to natives, or roughly a reduction in native fertility of about half. Since the native-born population already has slightly below replacement level fertility, to advocate a one-half reduction in their fertility to accommodate immigration seems impractical in the extreme. Educational Attainment. Table 7 reports the education level of immigrants and natives. The top of the table reports figures for all persons ages 25 to 65. Based on the 2014 ACS, about 28 percent of immigrants 25 to 65 have not completed high school, compared to 8 percent of natives. This difference in the educational attainment of immigrants and natives has enormous implications for the social and economic integration of immigrants into American society. There is no single better predictor of economic success in modern America than one's education level. As we will see, the fact that so many adult immigrants have little education means their income, poverty rates, welfare use, and other measures of economic attainment lag well behind natives. Table 7 also shows that a slightly larger share of natives has a bachelor's degree than immigrants, and the share with a post-graduate degree is almost identical for the two groups. Historically, immigrants enjoyed a significant advantage in terms of having at least a college education. In 1970, for example, 18 percent of immigrants had at least a college degree, compared to 12 percent of natives.18 This advantage at the top end has now entirely disappeared. The middle of the Table 7 reports education level only for adults in the labor force.19 The figures are not entirely the same because those who are in the labor force age (18 and older) differ somewhat from the entire population (ages 25 to 65) in their educational attainment. For example, the least-educated natives in particular are much less likely to be in the labor force — working or looking for work. The right side of the table reports figures for those immigrants who arrived in 2010 or later. More recently arrived immigrants are significantly more educated than immigrants overall, with 40 percent of new arrivals having at least a college degree. However, it is still the case that new immigrants are about three times as likely to lack a high school education as natives. The increase in the education of new immigrants almost certainly reflects at least in part the decline of illegal immigration. Whether this large increase in immigrant skills is a temporary or permanent change is unknown. Overall, 16.8 percent of workers are immigrants and this is somewhat higher than their 13.3 percent share of the total U.S. population because, in comparison to natives, a slightly larger percentage of immigrants are of working age. The large number of immigrants with low levels of education means that immigration policy has dramatically increased the supply of workers with less than a high school degree, while increasing other educational categories more moderately. This is important because it is an indication of which American workers face the most job competition from foreign workers. While immigrants comprise 16.8 percent of the adult total workforce, they comprise almost half (47.6 percent) of adults in the labor force who have not completed high school. Figure 4 shows how recently arrived immigrants have increased the supply of different types of workers. It reports the number of immigrants who arrived in 2000 or later divided by the total number of workers in each educational category (immigrant and native). Thus, the figure shows that post-2000 immigrants have increased the supply of dropout workers by 21 percent, compared to 4 to 8 percent in other educational categories. This means that any effect immigration may have on the wages or job opportunities of natives will disproportionately affect the least educated native-born workers. Income and Wages. In this report we show figures for both earnings and income. Earnings are income from work, while income can be from any source, such as working, investments, or rental property. Given the large proportion of immigrants with few years of schooling, it is not surprising that the income figures reported at the bottom of Table 7 show that, as a group, immigrants have lower median earnings than natives.20 (Earnings from the CPS are based on annual income from work in the calendar year prior to the survey.) The annual median earnings of immigrants who work full-time and year-round are only about 81 percent those of natives. And for the most recent immigrants, median earnings are 76 percent those of natives. Another way to think about immigrants and natives in the labor market is to examine the share of immigrants and natives who work for low wages. In 2015, 14.7 percent of immigrants were in this bottom wage decile, compared to 9.2 percent of natives. If we examine the weekly wages for the poorest fifth of the labor market, 29.4 percent of immigrants fall into the bottom quintile, compared to 18 percent of native-born full time year round workers. Household Income. Another way to think about the relative position of immigrants compared to natives is to look at household income. The bottom of Table 7 reports that the median household income of immigrant-headed households is $49,561, which is 91 percent that of the household income of natives — $54,695. In addition to having lower incomes, immigrant households are 30 percent larger on average than native households — 3.09 persons vs. 2.38 persons. As a result, the per capita household median income of immigrants is only 70 percent that of natives — $16,025 vs. $22,941. This is important not only as a measure of their relative socio-economic standing, but also because it has fiscal implications. Lower household income means that in general immigrant households are likely to pay somewhat less in taxes than native households. This is especially true for progressive taxes, such as state and federal income taxes, which take into account income and the number of dependents. Larger household size also means that, in general, immigrant households will use somewhat more in services than native households. Since households are the primary basis on which taxes are assessed and public benefits distributed in the United States, the lower income and larger size of immigrant households has implications for public coffers. Age of Immigrants. The bottom of Table 7 shows that in 2014 the median age of an immigrant was 43, compared to a median of 35 for natives. The median overall age in the United States was 37. The fact that immigrants have a higher median age is a reminder that although immigrants may arrive relatively young, they age over time like everyone else. The bottom of Table 7 also shows that 13 percent of both immigrants and natives are over age 65. This, too, is a reminder that immigrants age. The idea that immigration is a solution to an aging society is largely misplaced partly because of the simple fact that immigrants age over time. Those who argue that immigration will fundamentally change the age structure generally have in mind new arrivals. In 2014, the median age of an immigrant who arrived in 2010 or later was 28, compared to 35 for natives. Looking at the newest arrivals, those who came in 2013 or the first half of 2014, had a median age of 27. This confirms the common belief that immigrants are younger than natives at arrival, but the difference with natives is not enormous. The presence of these new immigrants has little impact on the age structure. If, for example, the 5.2 million immigrants who arrived in 2010 or later are removed from the data, the median age in the United States would still be 37 years. But four years of immigration is not very long and the above analysis does not include children born to immigrants. If we remove from the 2014 ACS the 17.3 million immigrants who arrived since 2000 plus their 3.9 million native-born children, the median age in the United States would be 38 years.21 Again this compares to 37 years when post 2000 immigrants and their children are included. This means that the full impact of post-2000 immigration on the median age in the United States was to reduce it by only one year.22However, median age is probably not the best way to think about this question. The main concern with an aging society is that there will not be enough people of working age to pay for government or support the economy. We can estimate the overall impact of immigration on the age structure by looking at the share of the population that is of working-age (16 to 65) using the 2014 ACS. In 2014, 66.2 percent of the total population was 16 to 65. If all 17.3 million immigrants in 2014 who indicated that they arrived in 2000 or later are removed from the data, 65.1 percent of the population would be of working age. If we remove post-2000 immigrants plus their 3.9 million native-born children, 66 percent of the U.S. population would be of working age. Again, this compares to 66.2 percent when these immigrants and their children are included. Clearly, the impact of immigration on the share of the population that is of working age is quite small. Immigration adds to the working-age population, but it also adds to the population too old or too young to work. The modest size of the impact on aging is especially apparent when we consider that post-2000 immigration plus births to these new immigrants added some 21.2 million new people to the U.S. population. Even immigration and births to immigrants of this scale only has a small impact on changing the nation's age structure. One of the reasons immigration will also have a modest impact on aging going forward is shown at the bottom of Table 7. Immigrant fertility is not that much higher than that of natives. The total fertility rate (TFR) of immigrant women in 2014 was 2.2 children, compared to 1.78 for natives. TFR is a measure of fertility used by demographers to measure the number of children a woman can be expected to have in her lifetime given current patterns.23 The ACS asks all women in their childbearing years if they had a child in the last year, so it is a straightforward matter to calculate fertility using the survey. The total fertility rate in the United States (immigrant and native) is 1.85. Without immigrants the rate would be the TFR for natives of 1.78. Thus, the presences of immigrants raises the TFR of the country by .08 — about 4 percent.24 While immigrants do tend to arrive relatively young and have somewhat higher fertility rates than natives, immigrants age just like everyone else, and the differences with natives are not large enough to fundamentally alter the nation's age structure. Demographers, the people who study human populations, have long known this is the case. In an important 1992 article in Demography, the leading academic journal in the field, economist Carl Schmertmann explained that, mathematically, "constant inflows of immigrants, even at relatively young ages, do not necessarily rejuvenate low-fertility populations. In fact, immigration may even contribute to population aging. "25 The Census Bureau also concluded in projections done in 2000 that immigration is a "highly inefficient" means for increasing the percentage of the population that is of working-age in the long run.26 In a paper presented at the annual meeting of the Population Association of America in 2012 by myself and several co-authors, we also showed that immigration has only a small impact on aging, but a large impact on the size of the U.S. population.27 There is a clear consensus among demographers that immigration has a positive but small impact on the aging of society like ours. A simple analysis of the ACS data confirms this conclusion. Labor Force Attachment. Table 8 shows the share of immigrant and native-born men and women holding a job or in the labor force based on the March 2015 CPS. Those in the labor force have a job or are looking for a job.28 The top of the table reports figures for persons 18 to 65 and the lower portion of the table provides the same figures for those in the primary working years of 25 to 55 — when rates of employment tend to be the highest. The table shows that immigrants and natives (18 to 65) overall have virtually identical rates of employment and labor force participation. However, male immigrants have higher rates of employment and labor force participation than native-born men, while female immigrants have lower rates than their native-born counterparts. For those in the prime working years of 25 to 55, Table 8 shows that the overall rates of native employment and labor force participation are somewhat higher than for immigrants. But male immigrants 25 to 55 are still more likely to work or be looking for work than native-born men. In contrast, native-born women in the primary employment years are much more likely to work than are foreign-born women. As is discussed throughout this report, immigrants' income, health insurance coverage, home ownership, and other measures of socio-economic status lag well behind those of natives. But Table 8 shows that these problems are not caused by immigrants being unwilling to work. Immigrant men in particular have a strong attachment to the labor market. Occupational Distribution. Table 9 shows the occupational concentration of immigrants and natives. The major occupational categories are shown in bold and ranked based on immigrant share, shown in the first column. The numbers in the second and third columns show natives and immigrants in each occupation (whether working or looking for work in the occupation). The table shows several important facts about U.S. immigration. First, there are millions of native-born Americans employed in occupations that have high concentrations of immigrants. While immigrants certainly are concentrated in particular occupations, it is simply not correct to say that immigrants only do jobs natives don't want. There are more than 25 million native-born Americans in the occupational categories of farming/fishing/forestry, building cleaning/maintenance, construction, production, and food service and preparation. A second interesting findings in Table 9 is that in these top immigrant occupations unemployment for natives averaged almost 10.2 percent in 2014, compared to 6.0 percent nationally. It is hard to argue that there are no Americans willing to work in these high-immigrant professions. Perhaps the native-born workers are not where employers want, or there is some other reason businesses find these unemployed natives unacceptable, but on its face Table 9 indicates that there are quite a lot of Americans willing to work at jobs that are often thought to be high-immigrant occupations. A third interesting finding in Table 9 is the enormous variation in the immigrant share of different occupations. Less than 7 percent of lawyers are foreign-born. Only about 5 percent of reporters working for English-language media outlets are immigrants, as are fewer than 6 percent of farmers and ranchers. In contrast, roughly half of maids and a third of butchers and construction laborers are foreign-born. This uneven distribution across occupations means that some Americans face a good deal more competition from immigrant workers, while others face very little. This distribution not only has economic implications, but also may help to explain the politics of immigration. Reporters and lawyers are important opinion leaders in our society, and they face relatively little competition from immigrants. It would be a mistake to think that every job taken by an immigrant is a job lost by a native. Many factors impact labor market outcomes. But, it would also be a mistake to assume that dramatically increasing the number of workers in these occupations as a result of immigration policy has no impact on the wages or employment prospects of natives. Poverty Among Immigrants and Natives. The first column in Table 10 reports the poverty rate for immigrants by country and the second column shows the figures when their U.S.-born children under age 18 are included with their immigrant parents.29 Based on the March 2015 CPS, 18.5 percent of immigrants, compared to 13.5 percent of natives, lived in poverty in 2014.30 (Poverty statistics from the CPS are based on annual income in the calendar year prior to the survey and reflect family size.) The higher incidence of poverty among immigrants as a group has increased the overall size of the population living in poverty. In 2014, 16.7 percent of those in poverty in the country were immigrants. In some reports, the U.S.-born children of immigrants are counted with natives. But it makes more sense to include these children with their immigrant parents because the poverty rate of minor children reflects their parents' income. Overall, in the United States there are 59 million immigrants and U.S.-born children (under 18) with either an immigrant father or mother. In the analysis of poverty and insurance coverage in this report we focus on the 56.4 million immigrants and their children (under 18) with an immigrant father. Those with an immigrant mother and a native-born father are counted with natives. In this way, we avoid overstating the impact of immigration. It should be noted that if those with only an immigrant mother are added to the poverty totals for immigrants and their children it would add slightly to poverty associated with immigrants. The data by country and region indicate that there is an enormous variation in poverty rates among immigrants from different countries.31 For example, the 29.5 percent of Mexican immigrants and their U.S.-born children living in poverty is many times the rate associated with immigrants from countries such as India and the Philippines. Of the 46.7 million people in the United States living in poverty in 2014 (based on the 2015 data), 11.7 million or 25 percent are immigrants or the U.S.-born children (under 18) of immigrant fathers. Among persons under age 18 living in poverty, 30 percent are either immigrants or the young children of an immigrant fathers. Immigration policy has significantly added to the population in poverty in the United States. In or Near Poverty. In addition to poverty, Table 10 also reports the percentage of immigrants and natives living in or near poverty, with near-poverty defined as income less than 200 percent of the poverty threshold. Examining those with incomes under 200 percent of poverty is an important measure of socio-economic status because those under this income generally do not pay federal or state income tax and typically qualify for a host of means-tested programs. As is the case with poverty, near-poverty is much more common among immigrants than natives. 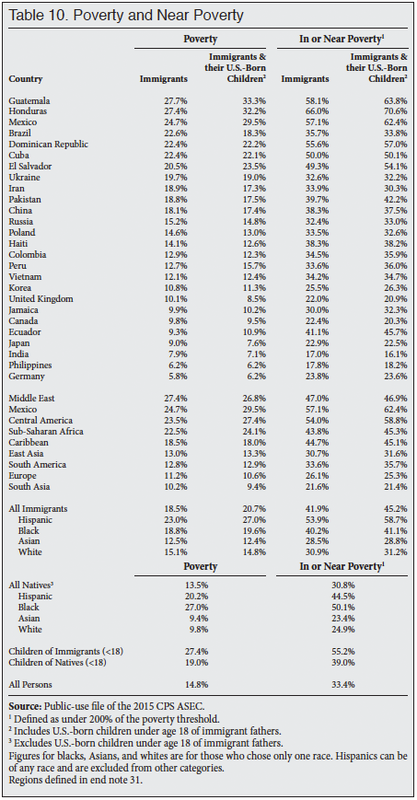 Table 10 shows that 41.9 percent of immigrants compared to 30.8 percent of natives live in or near poverty. (Like the figures for poverty, the figures for natives exclude the U.S.-born minor children of immigrant fathers.) If the U.S.-born children of immigrants are included with their immigrant parents, the immigrant rate is 45.2 percent. Among the young children of immigrants (under 18), 55.2 percent live in or near poverty, in contrast to 39 percent of the children of natives. In total, 25.5 million immigrants and their young children live in or near poverty. As a share of all persons in or near poverty, immigrants and their young children account for 24.2 percent. Without Health Insurance. Table 11 reports the percentage of immigrants and natives who were uninsured for all of 2014. (The CPS asks about health insurance in the calendar year prior to the survey.) The table shows that lack of health insurance is a significant problem for immigrants from many different countries and regions. Overall, 21.4 percent of the foreign-born lack health insurance, compared to 8.8 percent of natives. (Like the figures for poverty, Table 11 excludes the U.S.-born minor children of immigrant fathers from the figures for natives.) Immigrants account for 27.3 percent of all uninsured persons in the United States. This compares to their 13.3 percent share of the total population in the 2015 CPS. If the young (under 18) U.S.-born children of immigrant fathers are included with their parents, the share without health insurance is 17.9 percent. The share of children who are uninsured is lower than for their parents mainly because the U.S.-born children of immigrants are eligible for Medicaid, the health insurance program for the poor. Thus, the inclusion of the U.S.-born children pulls down the rate of uninsured immigrants slightly. In total there are 10.1 million uninsured immigrants and their young U.S.-born children in the country, accounting for 30.6 percent of all persons without health insurance. This is dramatically higher than their 17.8 percent share of the total population. The low rate of insurance coverage associated with immigrants is very much related to their much lower levels of education. Because of the limited value of their labor in an economy that increasingly demands educated workers, many immigrants hold jobs that do not offer health insurance, and their low incomes make it very difficult for them to purchase insurance on their own. A larger uninsured population cannot help but strain the resources of those who provide services to the uninsured already here. Moreover, those with insurance have to pay higher premiums as health care providers pass along some of the costs of treating the uninsured to paying customers. Taxpayers are also affected as federal, state, and local governments struggle to provide care to the growing ranks of the uninsured. There can be no doubt that by dramatically increasing the size of the uninsured population our immigration policy has wide ranging effects on the nation's health care system. Do Uninsured Immigrants Cost Less? One study found that after controlling for such factors as education, age, and race, uninsured immigrants impose somewhat lower costs than uninsured natives. However, when the authors simply compared uninsured immigrants to uninsured natives the cost differences were not statistically significant. In other words, when using the actual traits that immigrants have, the costs that uninsured immigrants create were the same as uninsured natives.32 It seems likely that uninsured immigrants do cost less than uninsured natives because the immigrants are more likely to be in younger age cohorts where use of health care is less. Of course even if the average uninsured immigrant costs less than the average uninsured native, the difference would have to be enormous to offset the fact that immigrants are almost 2.5 times more likely to be uninsured than native-born Americans. Immigration and Growth in the Uninsured. Because of Medicaid expansion and direct and indirect subsidies under the Affordable Care Act (ACA), the number of uninsured people has declined in recent years. While the costs and benefits of the ACA are not part of this analysis, we can say that prior to the act immigration played a very large role in the growth of the uninsured population. New immigrants and their U.S.-born children accounted for about two-thirds of the growth in the uninsured from 2000 to 2011.33 Thus to a significant extent the growth in the uninsured in the United States, which was one of the primary arguments for the ACA, was driven by the nation's immigration policies. Uninsured or on Medicaid. The 2015 CPS shows that 27.1 percent of immigrants and their U.S.-born children under 18 are on Medicaid, compared to 17.9 percent of natives and their children.34 Thus, the large share of immigrants and their U.S.-born children who are uninsured is not due to their being unable to access Medicaid per se. Their use of Medicaid is actually higher than that of natives. It is true that unlike natives, illegal immigrants are not supposed to be enrolled in the program unless they are pregnant and most new legal immigrants are barred as well. Nonetheless, despite these prohibitions, more immigrants and their children use Medicaid than do natives and their children. One reason for this is that the overwhelming majority of legal immigrants have been in the country long enough to access the program. Combining the uninsured and those on Medicaid together shows that 45 percent of immigrants and their young children (under 18) either have no insurance or have it provided to them through the Medicaid system, compared to 26.7 percent for natives and their children. These numbers are a clear indication of the enormous impact immigration has on publicly financed health care. Welfare Use. As the Census Bureau does in many of its publications, we report welfare use based on whether the head of the household is immigrant or native.35 With regard to immigrant households, this means we are mainly reporting welfare use for immigrants and their U.S.-born children who live with them and comparing them to natives and their children. Table 12 shows the percentage of immigrant- and native-headed households in which one or more members uses a welfare program(s). The definition of programs is as follows: cash assistance: Temporary Assistance to Needy Families (TANF), state-administered general assistance, and Supplemental Security Income (SSI), which is for low-income elderly and disabled persons; food assistance: Supplemental Nutrition Assistance Program (SNAP, informally know as food stamps), free and subsidized school lunch, and the Women, Infants, and Children nutrition program (WIC); housing assistance: subsidized and government-owned housing. The table also shows figures for Medicaid use, the health insurance program for those with low incomes. Table 12 shows that use of food assistance is significantly higher for immigrant households than it is for native households — 27.3 percent vs. 15.9 percent. The same is also true for Medicaid, 33.6 percent of immigrant households have one or more persons using the program compared to 20.3 percent of native households. From the point of view of the cost to taxpayers, use of Medicaid by immigrants and their dependent children is the most problematic because that program costs more than the combined total for the other welfare programs listed. Use of cash tends to be quite similar for immigrant and native households. Thus if by "welfare" one only means cash assistance programs, then the CPS ASEC shows immigrant use is roughly the same as natives. Of course, there is the question of whether native use of welfare is the proper yardstick by which to measure immigrants. If immigration is supposed to be a benefit, our admission criteria should, with the exception of refugees, select only those immigrants who are self-sufficient. Table 12 shows that welfare use, even of cash programs, is not at or near zero. As was the case with lower income and higher poverty rates, the higher welfare use rates by immigrant households are at least partly explained by the large proportion of immigrants with few years of schooling. Less educated people tend to have lower incomes. Therefore, it is not surprising that immigrant household use of the welfare system is significantly higher than that of natives for some types of programs. Under-Reporting of Welfare Use. While welfare use rates are quite high for many sending countries, there is general agreement that the CPS ASEC actually understates welfare use. We know this because the number of people who report in the survey that they are using particular programs is a good deal less than the number shown in administrative data. There is another Census Bureau survey called the Survey of Income and Program Participation specifically designed to capture welfare use and it does a significantly better job of reporting welfare use than any other Census survey, including the CPS ASEC. An extensive analysis comparing administrative data to eight different government surveys conducted for the Department of Health and Human Services (HHS) concluded that the "SIPP performs much better than other surveys in identifying program participants. "36 Other research shows the same thing.37 Unfortunately, the SIPP is not released on timely basis like the CPS, nor does the public-use SIPP report individuals' sending-countries. In an extensive report done by the Center for Immigration Studies using the SIPP we found that in 2012 (the most recent SIPP available) 51.3 percent of immigrant households used one or more welfare programs, compared to 30.2 percent of native households. Data from the CPS ASEC for the same year showed 38.5 percent for immigrants and 24 percent for natives.38 If we adjust up the overall welfare use rates from Table 12 to reflect the likely undercount based on the SIPP, it would imply that 56.6 percent of immigrants used one or more welfare programs as did 33.8 percent of natives. The programs listed in Table 12 cost the government well over $700 billion annually and this is a reminder that immigration has important implications for public coffers. Use of the EITC and ACTC. In addition to welfare programs, Table 12 reports the share of households in which at least one worker is eligible for the Earned Income Tax Credit (EITC) and the refundable portion of the Additional Child Tax Credit (ACTC).39 Based primarily on income and number of dependents, the Census Bureau calculates eligibility for these programs and includes this information in the public-use CPS files. Workers receiving the EITC pay no federal income tax and instead receive cash assistance from the government based on their earnings and family size. The ACTC works in the same fashion, except that to receive it, one must have at least one dependent child. The IRS will process the EITC and ACTC automatically for persons who file a return and qualify. Even illegal aliens sometimes receive the EITC and ACTC. This is especially true of the ACTC because the IRS has determined that illegals are allowed to receive it, even if they do not have a valid Social Security number. To receive the EITC, one must have a valid Social Security number. With an annual cost of over $40 billion for the EITC and $35 billion for the ACTC, the two programs constitute the nation's largest means-tested cash programs for low-income workers. Table 12 shows that 23.5 percent of immigrant-headed households have enough dependents and low enough income to qualify for the EITC and 17.2 percent have low enough incomes to receive the ACTC. This compares to 10.9 and 6.9 percent respectively for natives. As already stated, the figures for the EITC and ACTC probably overstate receipt of the programs for both immigrants and natives because they are imputed by the Census Bureau. This is in contrast to the welfare programs listed, which are based on self-reporting by survey respondents, though as already discussed welfare use is underreported in the CPS ASEC. Given the low education level of so many immigrants it is not surprising that a large share work, but that their incomes are low enough to qualify for the EITC and ACTC. It important to understand that the high rate of EITC and ACTC eligibility does not reflect a lack of work on the part of immigrants. In fact, one must work to be eligible for them. Nor does the relatively high use of welfare programs reflect a lack of work on the part of immigrants. In 2014, 82.8 percent of immigrant households had at least one worker, compared to 74.3 percent of native households. Work in no way precludes welfare use and it is required to receive the EITC and ACTC. The high rate of welfare use by immigrant households should also not be seen as moral failing. Like all advanced industrial democracies, the United States has a well-developed welfare state. This fact coupled with an immigration system that admits large numbers of immigrants with modest levels of education and tolerates large-scale illegal immigration is what explains the figures in Table 12. In short, many immigrants come to America to find a job and have children. Their low incomes mean that many are unable to support their own children and so turn to taxpayers to help support them. While that does not mean that immigrants come to American to get welfare, many immigrants do use these programs, creating large costs for taxpayers. Welfare Use by Country and Region. Table 12 shows that immigrants from some countries have lower welfare use rates than natives while those from other countries have much higher use rates. Mexican, Honduran, and Dominican households have welfare use rates that are much higher than natives — even higher than for refugee-sending countries like Russia and Cuba. 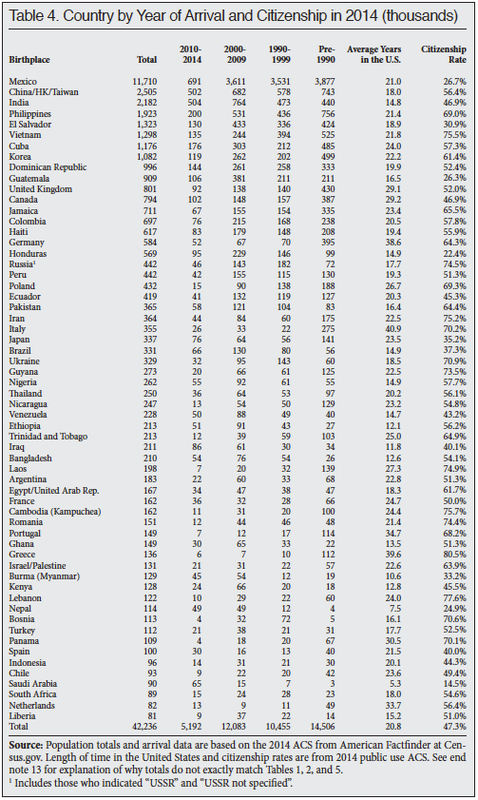 In fact, if one excludes the primary refugee-sending countries, as shown in the bottom portion of Table 12, the share of immigrant households using a welfare program remains virtually unchanged at 42.1 percent.40 Refugees are simply not a large enough share of the foreign-born, nor are their rates high enough to explain the level of welfare use by immigrant households. Or put a different way, the relatively large share of immigrant households using welfare is not caused by refugees. Welfare for Households with Children. The bottom of Table 12 makes a number of different comparisons between immigrant and native households. Households with children have among the highest welfare use rates. The share of immigrant households with children using at least one major welfare program is high — 60.3 percent. The share of native households with children using welfare is also very high. But the figures for immigrants do mean that a very large share of immigrants come to America and have children but are unable to support them. As a result, immigrant households with children make extensive use of food assistance and Medicaid. This raises the important question of whether it makes sense to allow the large-scale settlement of immigrants who are unable to support their own children. Welfare Use Among Working Households. The bottom of Table 12 shows the share of households with at least one worker using welfare. The table shows that 41.7 percent of immigrant households with at least one working person still use the welfare system. This compares to 24.5 percent of native households with at least one worker. Most immigrant households have at least one person who worked in 2014. And as we have already seen, immigrant men in particular have high rates of work. But this in no way means they will not access the welfare system, particularly non-cash programs, because the system is designed to provide assistance to low-come workers with children and this describes a very large share of immigrant households. Given their education levels, and relatively large family size, many immigrant households work and use the welfare system. In fact, of immigrant households using the welfare system, 82.8 percent had at least one worker during the year. For native households, it was 74.3 percent. All of this is a very important reminder that bringing less-educated workers to fill low-wage jobs rather than relying on the supply of less-educated workers already in the country can create very large costs for taxpayers. Self-Employment. Table 13 examines the self-employment rates of immigrants and natives. The table shows that immigrants and natives exhibit remarkably similar levels of entrepreneurship, at least when measured by self-employment rates. The table shows that 11.4 percent of immigrants and 11.1 percent of natives are self employed. Some people argue that immigrants are more likely to start businesses than natives. If true, the self-employment rates indicate that their businesses may fail at higher rates so that in term of overall rates of entrepreneurship the rates of immigrants and natives are nearly identical. Entrepreneurship is neither lacking nor a distinguishing characteristic of the nation's immigrants. If one removed immigrants from the data, the overall rate of self-employment in the United States would be about the same. Of course, the table also shows that immigrants from some countries do have very high rates of self-employment, while others have very low rates. The bottom of Table 13 reports the share of immigrants and natives who have a part-time business. That is, they report self-employment income, but do not indicate that this is their primary employment. Natives are slightly more likely than immigrants to be self-employed part-time — 1.7 percent vs. 1 percent. Overall, 12.8 percent of natives and 12.4 percent of immigrants are self-employed full- or part-time. Again, this is a tiny difference. Turning to self-employment income, we see that the average self-employment income (revenue minus expenses) of immigrants is slightly higher than that of natives, though the average is quite low for both groups. It seems likely that operators of small business are very reluctant to provide the government with information about their business income and this at least partly explains the very low reported income for both groups in Table 13. The table also reports the share of entrepreneurs whose businesses have more than 10 employees. Self-employed natives are somewhat more likely to have larger business than self-employed immigrants — 19.1 percent vs. 16 percent. But this still means that the vast majority of immigrant and native business are small. Like self-employment rates and income, in general the CPS shows little difference in the number of employees for immigrant and native entrepreneurs. Household Income. Table 14 shows average and median household income. The average household income of immigrant households is only slightly lower than that of native households. Turning to median income, the table shows a larger difference, with immigrant households having income that is 10 percent below that of natives. The larger difference between median and mean is almost certainly due to income among immigrants being somewhat more skewed than native income, with a large share of immigrant households on the high and low income extremes. As discussed earlier in this report, Table 14 shows there is a large difference with natives in per-capita household income, whether it is calculated by dividing median or mean income by household size. Immigrant households are 30 percent larger than native households. Per-capita median household income for natives is $6,916 (43 percent) higher than per-capita median immigrant household income. Per-capita mean household income for natives is $7,178 (31 percent) higher than that of immigrants. Immigrant household income does not differ that much from native household income, but because the households are much larger on average, their per-capita income is much lower. Table 14 also shows large differences in income for immigrants by country and sending region. Immigrants from Canada and South Asia have very high household incomes, while those from Mexico, Central America, Sub-Saharan Africa, and the Caribbean tend to have relatively low incomes. It is worth noting that while the average income of some immigrant groups, such as South Asians, is much higher than that of natives, the per-capita household income is closer to that of natives because many of these immigrant groups have larger households on average than natives. Overcrowded Households. There are several possible measures of what constitutes an overcrowded household. The Department of Housing and Urban Development has compiled a detailed summary of the overcrowding literature and the various ways to measure it.41 Most researchers define a household as overcrowded when there is more than one person per room. The analysis that follows uses this standard definition of dividing the number of rooms in the housing unit by the number of people who live there. The ACS records the number of rooms by asking respondents how many separate rooms are in their house or apartment, excluding bathrooms, porches, balconies, foyers, halls, or unfinished basements. Dividing the number of rooms in a household by the number of people living there determines if the household is overcrowded. Overcrowding is a problem for several reasons. First, it can create congestion, traffic, parking problems, and other issues for neighborhoods and communities. Second, it can strain social services because the local system of taxation is based on the assumption that households will have the appropriate number of residents. Third, like poverty it can be an indication of social deprivation. 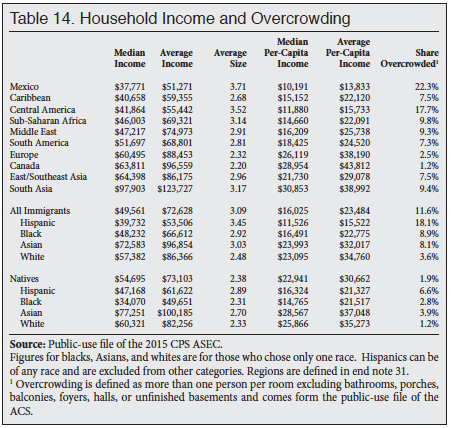 The far right column in Table 14 shows the share of households that are overcrowded for households headed by immigrants and natives.42 The 2014 ACS shows that 11.6 percent of immigrant-headed households are overcrowded, compared to 1.9 percent of native households. Because immigrant households are so much more likely to be overcrowded, they account for a very large share of such households. In 2014, immigrant-headed households accounted for 51 percent of overcrowded households, even though they are only 14.6 percent of all households. Table 14 shows that overcrowding varies significantly by sending region. Relatively few households headed by Canadians and Europeans are overcrowded. In contrast, it is quite common among immigrants from Mexico and Central America. Home Ownership. Owning a home has long been an important part of the American dream. Table 15 reports home ownership for immigrant and native households and some of the characteristics of those households.43 There is a very significant difference in home ownership rates between immigrants and natives. Overall, Table 15 shows that 50.8 percent of immigrant households are owner-occupied, compared to 65.3 percent of native-headed households. While it may seem that home ownership is a clear sign of belonging to the middle class, Table 15 shows that for immigrant households in particular this may not always be the case. 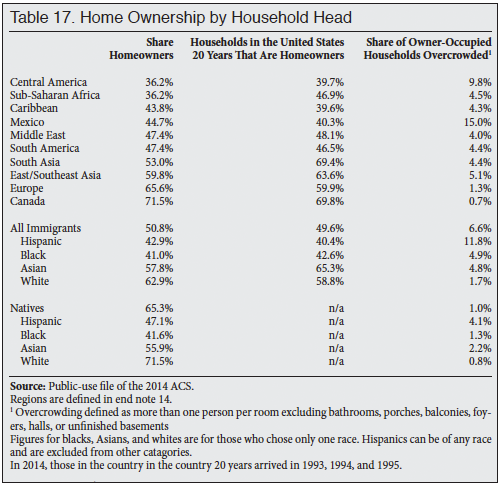 The table shows that overcrowding is much more common among owner-occupied immigrant households, with 6.6 percent being overcrowded, compared to just 1 percent of owner-occupied native households. While 6.6 percent is not a large percentage, it does mean that roughly one out of 15 owner-occupied immigrant households is overcrowded, compared to one out of a hundred for native households. The table also shows that 31.1 percent of owner-occupied immigrant households used at least one major welfare program, compared to 18 percent of native households. A somewhat larger share of immigrant households also has low incomes, with 29.5 percent below 200 percent of poverty, compared to 22.5 percent of native homeowners. Thus it would be a mistake to think that home ownership is always associated with being part of the middle class. 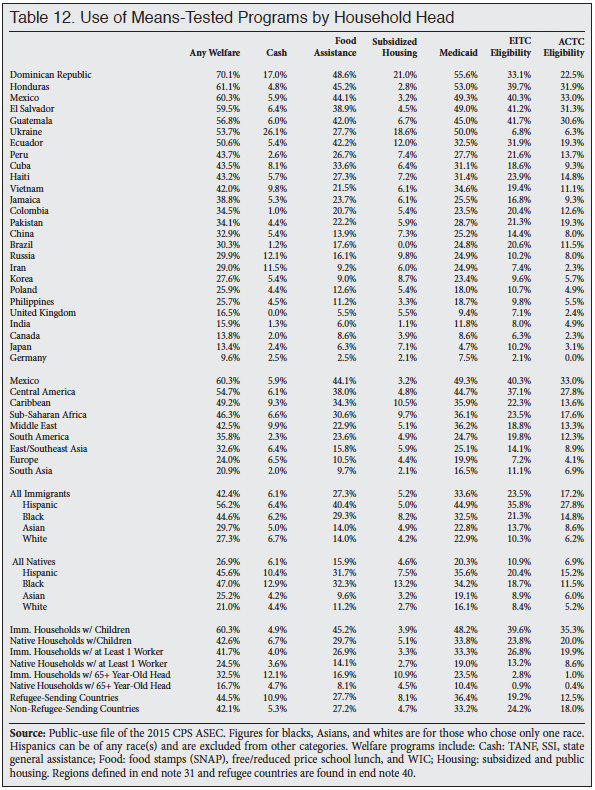 Table 16 shows home ownership rates by country of birth. As with the other socio-demographic characteristics examined so far in this report, there is significant variation by country. For example, the home ownership rate for households headed by German immigrants (73.1 percent) is over three times that of Dominican immigrants (23.5 percent). Table 17 shows home ownership rates by region, race, and ethnicity. In addition to overall rates, Table 17 shows home ownership rates for households headed by immigrants who have been in the country for 20 years.44 The table shows that immigrant households headed by these well-established immigrants have about the same rate of home ownership as immigrants over all. This does not mean that immigrant home ownership does not rise over time. In fact, as we will see later in this report, home ownership does increase significantly the longer immigrants live in the country. What is does mean is that the much lower rate of ownership for immigrants overall is not caused by a large number of new arrivals. Even immigrants who have been in the country for two decades still have substantially lower rates of home ownership than native-headed households. Language Ability. 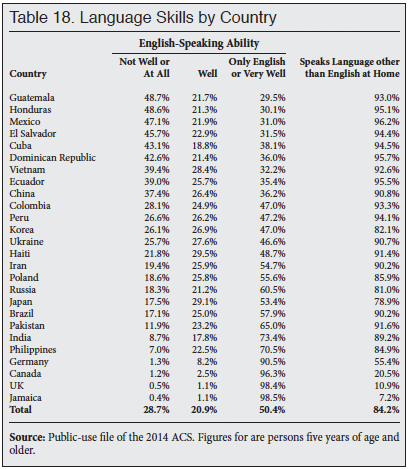 Table 18 reports immigrants' language ability by country. Table 19 shows the same information by region, race, and ethnicity. 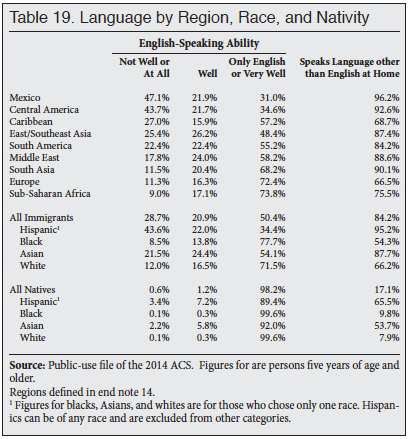 The 2014 ACS data on which the tables are based reports language skills for persons five years of age and older. The skill level is entirely based on the respondent's own opinion of their language ability. The tables show that about half of all immigrants report that they speak only English or speak it very well and almost 30 percent report that they speak it not at all or not well. Like the other tables reporting socioeconomic status by country or region in this Backgrounder, Tables 18 and 19 show significant variation in language ability. Not surprisingly, the vast majority of immigrants from English-speaking countries such as Guyana, the United Kingdom, and Jamaica report that they speak only English or speak it very well. In contrast, a near majority of immigrants from Guatemala, Honduras, Mexico, and El Salvador report that they speak English not at all or not well. There is a large body of research showing that language skills are a key determinant for immigrant earnings. The large share of immigrants from Latin America that have limited or no English language ability must play a significant role in the high rates of poverty, near poverty, lack of health insurance, and welfare use reported for these groups earlier in this report. In the last few years, a good deal of attention has been focused on the dramatic increase in enrollment experienced by many school districts across the country. While it has been suggested that this increase is the result of the children of baby boomers reaching school age, the so called "baby boom echo," it is clear from the ACS that immigration policy accounts for the dramatic increase in school enrollment. Table 20 shows that there are 11.6 million school-age children from immigrant households. Of these students, 16.4 percent are immigrants themselves. The children of immigrants account for such a large percentage of the school-age population because a higher proportion of immigrant women are in their childbearing years and immigrants tend to have somewhat larger families than natives. 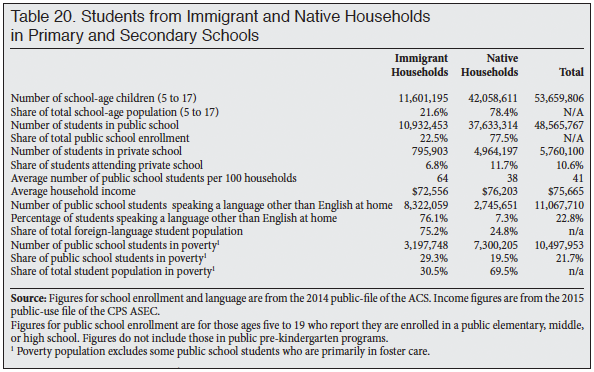 Table 20 shows that children from native households are significantly more likely to be in private school than children from immigrant households. As a result, children from immigrant households are a slightly larger share of public school students than they are of the school-age population. The 10.9 million children from immigrant households in public schools are 22.5 percent of all students in public school. Table 20 also shows the average number of public school students per household is dramatically larger for immigrant households. In 2014, there were 64 public school students for every 100 immigrant households, compared to 38 students per 100 native households. This means that the average number of public school students per immigrant household is about 70 percent larger than the number for native households. Of course, the dramatic increase in school enrollment caused by immigration may not strain public schools if tax revenue increases proportionately. However, as reported in Table 14, the median household income of immigrant households is about 10 percent less than the median household income of native households — $49,561 compared to $54,695. This almost certainly translates into lower average tax payments from immigrant households, as the household is the primary unit by which taxes are collected. The much larger number of students on average in immigrant households coupled with slightly lower income means that immigration is likely to create a fiscal strain for some public school districts in areas of large-scale immigrant settlement. Non-English Speakers. Another potential challenge for schools created by immigration stems from the large share of public school students from immigrant households who speak a language other than English. The bottom of Table 20 shows that 8.3 million (76 percent) of students from immigrant households speak a language other than English at home. In addition, there are nearly 2.8 million students from native households that speak a language other than English in public primary and secondary schools. In total, 22.8 percent of students in public school in the United States speak a language other than English at home. Speaking a language other than English at home does not mean the students struggle with English. Most of these students, it must be remembered, were born in the United States. However, providing appropriate language instruction for the millions of students for whom English is not their first language is a significant expense for many school districts. This fact, coupled with the much larger size of immigrant households and their lower average income, means that the arrival of large numbers of immigrant families will tend to strain the budgets of many school districts. Students in Poverty. A significant share of public school students live in poverty. The bottom of Table 20 shows that 29 percent of students from immigrant households in public school are in poverty and they account for nearly 31 percent of those in poverty. Thus, immigration has significantly added to the population of students in poverty, creating significant challenges for schools that are often already struggling to educate the children of natives who live in poverty. Table 20 shows that immigration has added significantly to the number of students with special needs, both in terms of language and poverty. The addition of so many such students can strain the resources of many districts. As public funds are limited, the difficulties immigration can create for schools may make it harder for them to meet the needs of their students, many of whom also suffer from social disadvantages. Poverty and Income Over Time. Both the ACS and CPS ask respondents when they came to the United States. Thus, it is possible to examine immigrants by year of arrival. Table 21 reports the progress of immigrants over time. The public-use CPS groups immigrants by multiple years of arrival in an effort to preserve anonymity. Table 21 reports year of arrival in the most detailed fashion possible using the public-use CPS data. The far left of Table 21 reports the length of time immigrants had been in the country in 2015. The next column reports the share in poverty, followed by the share in or near poverty, followed by the share without health insurance. The bottom of the table reports figures for all immigrants and natives.46 Table 21 reads as follows: In 2015, 29.9 percent of immigrants who have lived in the country for fewer than four years had incomes below the poverty threshold. The table also shows that 50.3 percent of the newest immigrants were in or near poverty, defined as income below 200 percent of the official poverty threshold. Those with income above this amount can be seen as middle class, while those with incomes below this amount can be viewed as the low-income population. Poverty and near poverty are also good measures of economic progress because they include people in and out of the workforce. Another advantage of using poverty to measure progress is that it controls for the number of people in a family. Two key findings can be drawn form Table 21. First, immigrants make significant progress the longer they reside in the United States. The newly arrived have much higher rates of poverty and near poverty than natives, but the longer the immigrants have lived in the country, the lower their poverty or near poverty. The share without health insurance coverage also declines significantly with time. The second key finding is that, despite this progress, it takes immigrants a very long time to close the gap with natives because they start out so much poorer. For example, immigrants who have been in the country for 20-21 years still have a poverty rate that is 40 percent higher than that of natives. Their rate of being in or near poverty is 39 percent higher than that of natives. The last column in Table 21 shows the average age of immigrants in 2015 based on how long they have lived in the country. The table shows that the poverty and near poverty rate of immigrants is similar to that of natives among those immigrants who have been in the country for 28-29 years. Because it takes immigrants so long to match the rates of natives, they tend to be much older than the average native-born Americans who have a similar rate of poverty or near poverty. Immigrants in the United States for 28 to 29 years are almost 51 years old on average, or 12 years older than the average native. Natives who are 51 years old have a rate of poverty of 10.5 percent, and their share in or near poverty is slightly under 23 percent. So although very long-time immigrant residents have poverty levels similar to natives overall, they are more likely to be poor than natives of the same age. This is important because it indicates that a much larger share of immigrants have low income during their adult lifetimes than natives. The difference between immigrants and natives is also somewhat understated in Table 21 because there are no children included for immigrants who have been in the country for 18 or more years because of the natural aging that occurs. This is important because poverty is higher for children than for adults. If the U.S.-born children (under 18) of immigrants who live with their parents were included in Table 21 the poverty rates shown would be higher. Table 21 provides important insight into how immigrants fare over time. However, it must be remembered that it is not known if today's new arrivals will follow a similar path. Table 21 only shows how immigrants are doing at one point in time. 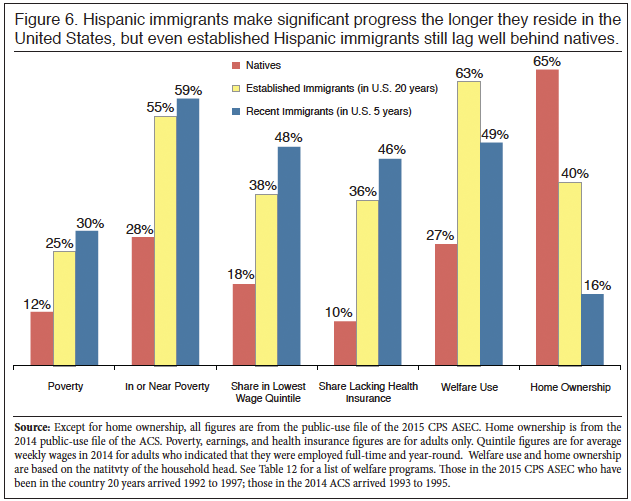 What we can say is that progress in terms of poverty and health insurance coverage was significant over time, yet this progress still leaves immigrants well behind natives, especially relative to natives of the same age. Welfare, Home Ownership, and Income Over Time. Table 22 reports welfare and home ownership rates by year of entry for households headed by immigrants. The table also reports average total personal income for adults (18-plus) by year of arrival. Turning first to the share of immigrant households using at least one welfare program, the table indicates that the improvement over time in poverty rates and health insurance coverage shown in Table 21, does not apply to use of welfare. Welfare use is a problem for new arrivals, well established migrants, and those in the country for more than 20 years. Only immigrants that have been here for four to five decades have welfare rates that match natives. Home ownership, on the other hand, rises significantly over time, though it takes immigrants a very long time to match the rates of natives. Households headed by immigrants that have been in the country for 34 to 35 years have home ownership rates that roughly match those of native-headed households — 65.9 percent. However, these households are headed by an immigrant who is 55 years old on average. Native households headed by a 55-year-old have a home ownership rate of 74 percent. Still, immigrant progress is significant over time and the overall rate of home ownership after a few years can be seen as high. On the other hand, home ownership in the United States is very common, partly as a result of direct and indirect government subsidies. Nearly two thirds of all households in the country are owner-occupied. Even among native households with incomes below the poverty line, 38 percent are still owner-occupied. Thus, high rates of home ownership are to be expected in America. This is especially true given the lax lending standards that became so pronounced in the last decade, which have been so criticized as contributing to a housing bubble and subsequent housing bust. Turning to average total income for adults (18-plus), Table 22 indicates that immigrant incomes rise the longer they reside in the United States. But like the other socioeconomic measures examined, only immigrants who have been in the country for a very long time have incomes roughly similar to natives. The table indicates that in 2015 immigrants who had been in the country for 26-27 years had average incomes that roughly match those of adult natives. Immigrants who have been in the country for this long are on average 48 years old on average. Native income at age 48 averages $52,612, or 26.6 percent higher than the income for immigrants in the country for 26-27 years. This is another indication that the lifetime income of the foreign-born is substantially lower than that of the native-born. Language Skills Over Time. Table 23 shows self-reported language skills based on the 2014 ACS. The ACS reports individual years of arrival, unlike the CPS, which groups year of arrival by multiple years. The table shows two-year groupings simply to make the table manageable. Table 23 shows significant improvement in language skills over time. Language skills, unlike other measures of progress, cannot be compared meaningfully to the native-born. Nevertheless, Table 23, provides reasons for both optimism and pessimism. On the one hand, immigrants report a clear and steady improvement in language skills over time. On the other hand, fewer than half of immigrants in the country for 25 to 26 years report that they speak only English or speak it very well. And more than one-fourth who have been in the country that long report that they do not speak English or, if they do speak it, they don't speak it well. Common sense and a large body of research indicate that knowing English is a key to improving one's life prospects. The large fraction of even long-time residents who report that they have not mastered English is troubling and contributes to the relatively low socioeconomic status of immigrants shown elsewhere in this report. Figures 5 and 6 report socioeconomic statistics for immigrants who have been in the country for five or fewer years and those here for 20 years.47 Figure 6 reports the same information, but for only Hispanic immigrants. Like Tables 21 and 22, Figure 5 indicates that even well established immigrants (those in the country 20 years) lag significantly behind natives. Figure 6 shows this is even more true for Hispanic immigrants. Even well established immigrants are dramatically poorer than natives and have much higher welfare use and much lower home ownership rates than natives. Progress Over Time by Age. As we have seen, time spent in the United States and age are, quite naturally, highly correlated. Immigrants who have been in the country longer tend to be older on average. Therefore, one way to think about progress over time is to examine socioeconomic status by age. Table 24 reports the share of immigrants in or near poverty (under 200 percent of poverty threshold), the share of workers in the bottom fifth of the wage distribution, and average total income. (Unlike income, wage data is only for those who are employed full-time and year-round.) All figures for both immigrants and natives are for adults 18 and older. 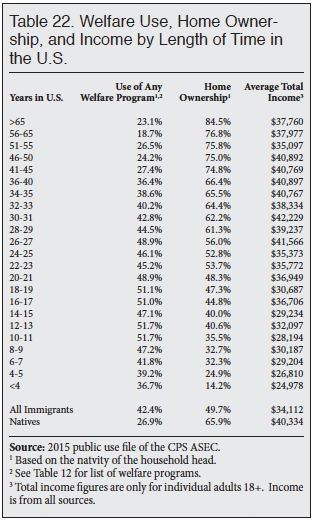 Table 24 shows that immigrant adults never come close to matching the income of natives of the same age, with the exception of average income for those 18 to 24. Figure 7 shows average income by age. 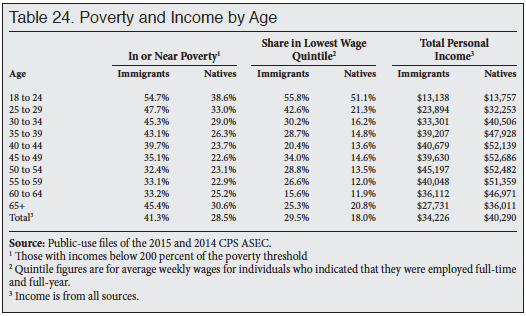 Both Table 24 and Figure 7 support the general observation that the lifetime income or wages of immigrants are substantially below those of natives, even though the immigrants do make progress over time as they age. Table 25 further reinforces this observation. It shows the average income and the share in or near poverty for immigrants in 2014/2015 who arrived in the 1990s and 1980s by age. (To obtain more robust estimates, Table 25 uses a combined sample of the March 2014 and 2015 CPSs.) On average, 1990s immigrants had been in the country for roughly 20 years in 2015 and 1980s immigrant had been here 30 years. Turning first to 1990s immigrants, Table 25 shows that the share of immigrants in or near poverty (under 200 percent of poverty threshold) is significantly higher for immigrants at every age. In terms of income, 1990s immigrants ages 30 to 34 come closest to natives. But the difference is still almost $5,000 on average, and in the other age groups the difference is about twice this amount. Like the age comparisons in Table 24 and Figure 7, the younger age cohorts come closest to matching natives. This is an indication that those immigrants who arrive young and grow up in the United States do better than those who arrive as adults. This makes perfect sense, since children will be more acclimated to the language and culture of the United States. Moreover, they will have greater access to educational opportunities. But children will always comprise a modest share of new arrivals because most people make the decision to go to a new a country in their late twenties, typically before they have children. 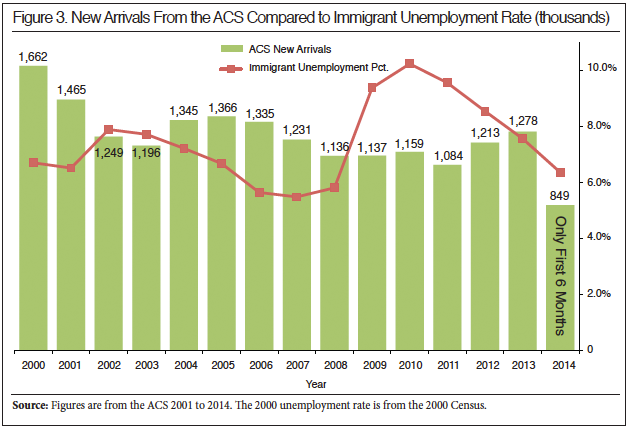 The ACS shows that in 2014, of the immigrants who arrived in 2013 or the first six months of 2014, three-fourths were adults. Immigrants generally do not come as children, nor do they generally arrive at older ages. Of the newest arrivals in 2014, 55 percent were between 18 and 39. The age of immigrants at arrival partly reflects the nation's immigration policy, but it mainly reflects the simple fact that people generally make the decision to leave their home countries as adults before age 40. This means that only a modest share of immigrants will ever grow up in the United States. The overwhelming majority will come as adults. The fact that young immigrants have more similar income and poverty rates to natives, while encouraging, will matter little to immigrants overall. The 1980s immigrants shown in Table 25 are somewhat better off at most age groups than are 1990s immigrants. This makes sense because these immigrants have lived in the United States considerably longer than 1990s immigrants. And as we have seen, conditions improve for immigrants over time. However, 1980s immigrants still have substantially higher rates of poverty/near poverty and lower average incomes than natives of the same age (with the exception of those ages 30-34 which seems to be a statistical anomaly). 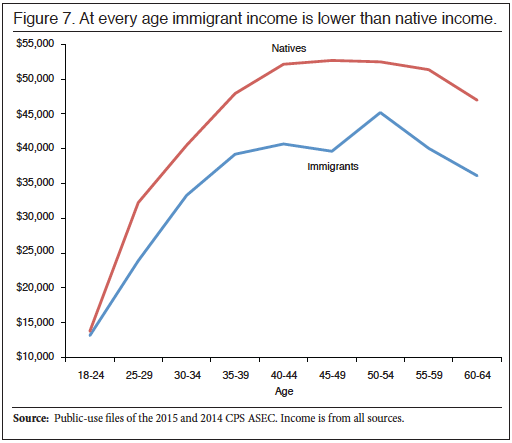 For example, across age groups immigrant income is on average 11 percent lower than native income. 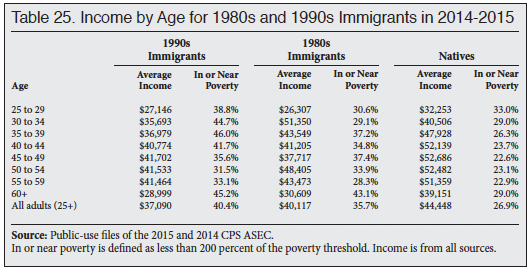 Immigrants who arrived in the 1980s can only be described as very well established in the United States by the time of the 2015 CPS, yet they are still a deal good poorer on average than natives of the same age. Tables 21 through 25 and Figures 5 through 7 show that it would be incorrect to think that immigrants do not do better the longer they live in the country. With the exception of welfare use, immigrants improve their situation over time for every measure examined. However, the tables and figures also show that even very long-time residents lag well behind natives. This is especially true compared to natives of the same age. Of course, we cannot say for sure that immigrants will continue to follow the same pattern in the future. But if they do, then they will arrive with relatively low incomes and make significant progress over time. But that progress will still leave them substantially poorer, more likely to use welfare, and less likely to have health insurance or be homeowners than natives, even after they have been in the country for two decades. In the discussion that follows we focus on Hispanics because nearly 60 percent of all children with immigrant parents are Hispanic.49 Therefore, how the descendants of Hispanic immigrants fare is one of the most important issues surrounding the current immigration debate. Moreover, the number of second-generation adults from most countries and for non-Hispanics in general is small in the CPS, making meaningful analysis by generation difficult. Comparing generations is not as straightforward as it may seem. First there is the issue of how to count minor children, who are by definition a different generation than their parents, but who are nonetheless dependent on their parents. (There is the case of immigrant children who arrive with their parents, in which case they are both considered the first generation.) This must be addressed when doing comparisons across generations. For this reason, when we examine poverty or health insurance coverage we report statistics only for adults in the analysis that follows. Second, there is research showing that persons whose ancestors are from a Spanish-speaking country are less likely to identify as "Hispanic" the higher their income and education.50 It is not entirely clear how much this issue matters. Mexicans are by far the largest Hispanic group and in the 2015 CPS, 98 percent of U.S-born individuals with a Mexico-born father identified as Hispanic, as did 98 percent of those with a Mexico-born mother. Ultimately, the term "Hispanic," like race, is a construct that relies on self-identification. So if individuals do not see themselves as Hispanic, it is difficult to argue that they are in fact "really" Hispanic. Moreover, unless Hispanic surnames are available, researchers using Census Bureau data have little choice but to rely on self-reported ethnicity, and we follow this practice. It is important to keep in mind that by examining the generations at one point in time we are not comparing parents and their children or even grandparents. The parents of today's second generation adults are generally not today's immigrants. Instead, the parents of today's second generation adults typically entered the country decades ago and have in most cases either passed away or have retired. The same is true of adults in the "third generation-plus" whose forbears, at the very least, entered many decades ago and in some cases centuries ago.51 What the data from 2015 can tell us is how past waves have done up to the present time. They cannot tell us whether the descendants of today's immigrants will follow the same pattern. Socioeconomic Status by Generation. 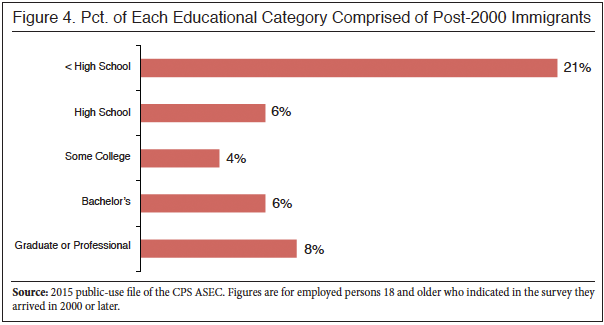 The first two sets of bars in Figure 8 show educational attainment for persons 25 to 65. The comparison is with non-Hispanic natives. As will be recalled from Tables 7 and 26, immigrants overall are much less likely than natives to have completed high school and are slightly less likely than natives to have at least a Bachelor's degree. Figure 8 shows that this difference with natives is much more pronounced among Hispanic immigrants, who are much less likely to have completed high school or have a Bachelor's degree. Turning to the second generation, Figure 8 shows that those adult Hispanics with immigrant parents are much more likely to have completed high school than foreign-born Hispanics — 46 percent vs. 13 percent. The same is true of third-generation Hispanics. However, relative to non-Hispanic natives, the share of second- and third-generation Hispanics who have not completed high school (15 percent) is still over twice as high. Furthermore, the high school completion rate for the third generation is slightly lower than the second generation. This implies no progress between the second and third generation in this area. Figure 8 also shows that the share of second- and third-generation Hispanics with at least a Bachelor's degree is significantly higher than foreign-born Hispanics. However, it is still dramatically lower than for non-Hispanic natives. Only 23 percent of second generation Hispanics have a college degree, compared to 36 percent of non-Hispanic natives. And for third generation Hispanics, the share with a Bachelor's degree is even lower, just 19 percent. Like the high school completion rate, this is an indication of no progress between the second and third generation for college completion. In fact, the data seems to imply some deterioration. This is very troubling given the importance of education in the modern American economy. The third and fourth sets of bars in Figure 8 show the share of adults, 18 and older, living in poverty and the share in or near poverty. In or near poverty is defined as income below 200 percent of the poverty threshold. The bars show that U.S.-born Hispanic adults have somewhat lower poverty than foreign-born Hispanics. However, even through the third generation the share of Hispanic adults in poverty is significantly higher than the share of non-Hispanic natives. The same is true for the share with income under 200 percent of the poverty threshold. Equally important, the poverty rate for adults is no better for the third generation relative to the second. Again, this indicates no progress between the second and third generations. The next set of bars shows the share of adults without health insurance. 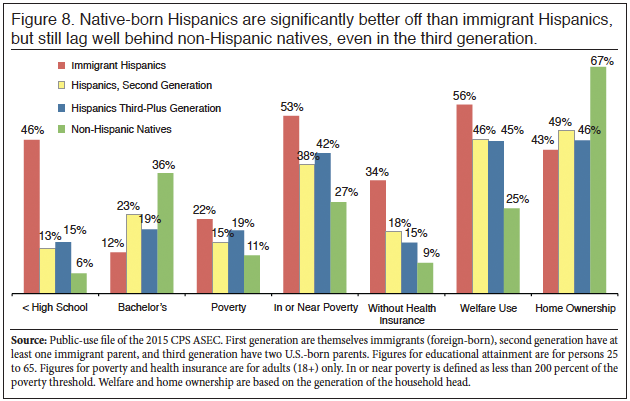 Like poverty, native-born Hispanics are much more likely than immigrants to have insurance. However, there is only modest progress between the second and third generation — from 18 percent to 15 percent. Both generations have high rates of Medicaid use; in 2015, 22 percent of second-generation adult Hispanics used the program, as did 21 percent in the third generation. This compares to 11.6 percent of non-Hispanic adult natives using Medicaid. Despite their much higher use of this program, U.S.-born Hispanics, both second and third generation, are still less likely to have health insurance than native-born non-Hispanics. The fifth set of bars shows welfare use. Welfare use is high for both Hispanic immigrants and for native-born Hispanics through the third generation. And as is the case with other measures in Figure 8, there seems to be no evidence of progress between the second and third generations. Turning finally to home ownership, Figure 8 shows that it is slightly higher for U.S.-born Hispanics than foreign-born Hispanics — 43 percent vs. 47 percent. However, the rates are still dramatically lower than for non-Hispanic natives. Furthermore, there seems to be no intergenerational progress between the first and second generations. On the other hand, the 47 percent home ownership rate for U.S.-born Hispanics (both second and third generation) can be seen as high. However, as discussed earlier, home ownership is very common in the United States. With 67 percent of non-Hispanic household's owner-occupied, the 47 percent shown for Hispanic natives through the third generation is low in relative terms. Income by Generation. Figure 9 reports earnings and total income; all figures are only for adults 18 and older. The income figures are lower than earnings because some adults, particularly those who do not work, may have little or no income and these individuals lower the average. The average earnings of adult Hispanic immigrants are $17,649, or 55 percent lower than that of non-Hispanic natives. For the second generation it is $15,114, or 44 percent lower. The average earnings of third generation Hispanics is $12,371, or 33 percent lower than that of average native-born non-Hispanics. This is an indication of progress between the generations and some convergence toward the earnings level of non-Hispanics natives. But again, the third generation still has significantly lower earnings than native-born non-Hispanics. While they are not shown in Figure 9, the difference between Hispanics and non-Hispanics in median earnings, rather than mean earnings, follows the exact same pattern.52 Figure 9 also shows that average income follows the same pattern as earnings, with the gap between Hispanics and non-Hispanics being somewhat larger than for earnings. One weakness of both Figure 8 and Figure 9 is that they do not fully control for age. A larger share of adult second- and third-generation Hispanics are young and this impacts income.53 Table 26 reports earnings by age and generation. It also reports the share in or near poverty. Like other measures examined in this report, Table 26 shows that native-born Hispanics are much better off than immigrant Hispanics. But Table 26 also shows that second and third generation Hispanics have much lower earnings than non-Hispanic natives in the same age cohort. The same pattern holds for the share in or near poverty, defined as less than 200 percent of the poverty threshold. 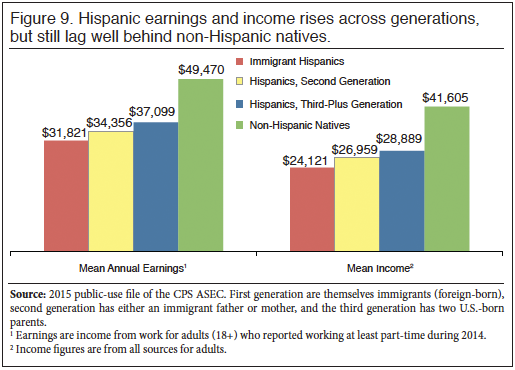 Figure 9 shows that the average earnings of third generation adult Hispanics is $12,371 (33.3 percent) lower than native-born non-Hispanics. In Table 26 the average difference in earnings for third generation Hispanics across age cohorts compared to non-Hispanics natives of the same age is $11,709, or about 28 percent lower. Table 26 indicates that some of the difference between the overall earnings of adult native-born Hispanics and non-Hispanics shown in Figure 9 is due to the relative youth of Hispanics. But most of the difference remains when age is controlled for. The same general pattern holds for second generation Hispanics. One other interesting finding in Table 26 is that the seeming progress from the second to third generations in earnings found in Figure 9 disappear once age is taken into account. As for the share in or near poverty, Figure 8 shows a 14.6 percentage point gap between third generation Hispanics and non-Hispanic natives overall. 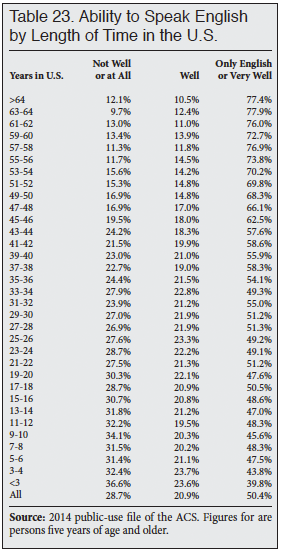 Table 26 shows that when age is controlled for, the difference averages 13 percentage points across the age cohorts. Thus, the much larger share of third generation Hispanics in or near poverty shown in Figure 8 remains even when age is taken into account. The overall conclusion from Table 26 is that, at least when it comes to average earnings and the share in or near poverty, the relative youthfulness of Hispanics natives does not explain the large difference with non-Hispanic natives. Generational Change, 1995-2014. 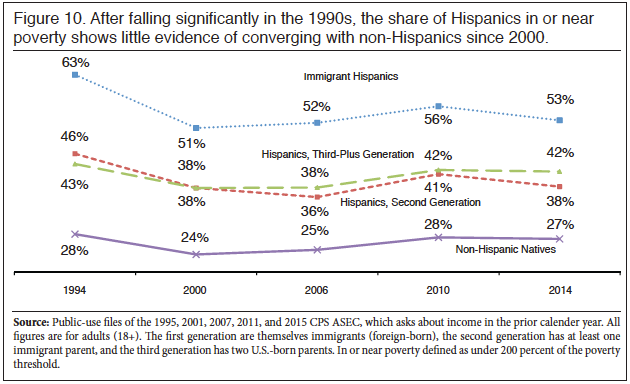 Figure 10 shows the share of Hispanics by generation living in or near poverty from 1994 to 2014. As was discussed earlier, in or near poverty (below 200 of poverty threshold) is an important measure because below this level, income taxes are generally not paid and it is where eligibility for many welfare and other means-tested programs begins. The figure shows that for all generations there was significant improvement from 1994 to 2000. The economic expansion of the 1990s lowered the share of all Hispanics in or near poverty. Perhaps most important, it narrowed the gap with non-Hispanic natives. But since 2000 the share of U.S.-born Hispanics has barely converged with non-Hispanic natives. The gap between third-generation Hispanics and native-born non-Hispanics has remained virtually unchanged for 14 years. The second generation has done a little better since 2010. The gap between non-Hispanic natives and second-generation Hispanics has gotten back to the level (11 percentage points) it was in 2006, but it is still quite large. The finding that native-born Hispanics do not close the gap with non-Hispanics even through the third generation is certainly not a new one. Other research has also found that while native-born Hispanics are better off than their foreign-born Hispanic counterparts, they are still significantly worse off than other natives.54 There is no consensus about the causes of this situation, nor is there a consensus about how to remedy it. A recent National Academy of Sciences (NAS) study acknowledged the lack of progress across generations among Hispanics, but pointed out that the problem is one primarily associated only with those of Mexican origin. For Hispanics such as those from Central America, the NAS study makes the case for "rapid educational integration". And it is true that the children of immigrants from Central America are much more likely to have a college degree than natives whose forbearers came from Mexico. However, Central Americans were small in number and actually more educated on average than natives in 1970, so it is not surprising that many of the children of these immigrants graduated college. But by the 1980s the Central American immigrant population had exploded in size and had become and remains dramatically less educated than natives. Other immigrants from Latin America follow a similar pattern. It is not at all clear that the children of these much less educated and more numerous immigrants, most of whom are still only young adults or children, will do well in the United States. Moreover, by some measures native-born Hispanics who are not of Mexican origin still struggle. For example, 40 percent of households headed by non-Mexican Hispanics (excluding Puerto Ricans) use at least one major welfare program. This is substantially higher than the 25 percent of non-Hispanic natives. (If Puerto Ricans are included, the rate is 48 percent.) The share of adult non-Mexican Hispanic natives (excluding Puerto Ricans) living in or near poverty is 26 percent higher than that of non-Hispanic natives. While many native-born Hispanics do well in the United States, many of both Mexican and non-Mexican origin struggle. Education Level of Immigrants. The statistics reviewed thus far indicate that a larger share of immigrants than natives have low incomes, lack health insurance, access means-tested programs, and in general have much lower socioeconomic status. As already mentioned, one of the primary reasons for this situation is that many immigrants arrive in the United States with relatively few years of schooling. 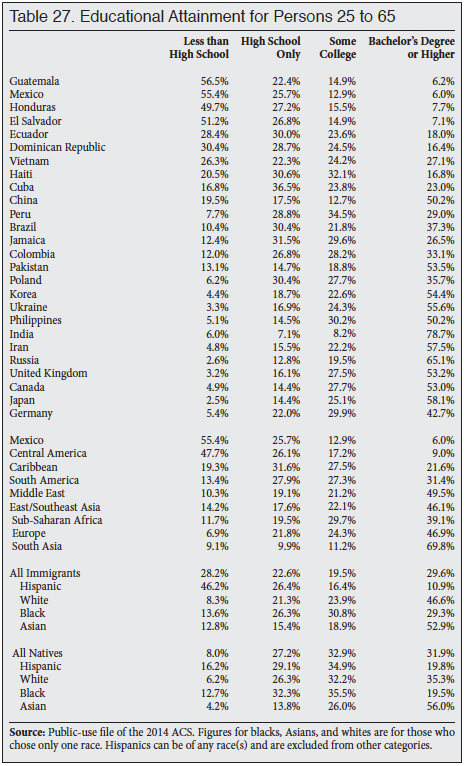 Table 27 reports the education level of immigrants ages 25 to 65 by country and region. The table shows very significant differences between immigrants by sending country and region. Some immigrant groups are much less educated on average than natives, while immigrants from other countries are much more educated than natives. Immigrants from Mexico and the Western Hemisphere (excluding Canada) in general tend to be the least educated, while those from South Asia, East Asia, and Europe tend to be the most educated. Looking back on Tables 10 through 19, we see that immigrants from those countries and regions that have the highest education levels tend to have the highest income and home ownership rates and lowest levels of poverty, welfare use, and uninsurance. Conversely, the least-educated immigrant groups tend to be the least prosperous. There is nothing particularly surprising about this finding. It has been well known for some time that education is one of the best predictors of economic outcomes in modern America. In fact, the benefits of education have become more pronounced in recent decades. The arrival of large numbers of less-educated adult immigrants means that many will struggle in the United States. As we have seen, this does not mean that they make no progress over time. Nor does it mean that they will not find jobs. But it does mean that absent a change in U.S. immigration policy, immigration will continue to add workers disproportionately to the bottom end of the labor market, where wages are the lowest and unemployment the highest. It also means that immigration will add disproportionately to the overall size of the low-income population in the United States. Importance of Education. The importance of education is shown very clearly in Table 28. The table reports income, poverty, health insurance coverage, and language skills for adults, and welfare use and home ownership based on the education of the household head. The table indicates that the least educated immigrants are much worse off than the average native. For example, the poverty rate for adult immigrants without a high school education (28.5 percent) is over 2.5 times the rate for adult natives overall (11.9 percent). For adult immigrants with only a high school education it is 50 percent larger than the overall native rate — 17.7 percent vs. 11.9 percent. However, immigrants with a college degree have a poverty rate that is somewhat lower than the rate overall for natives — 9.2 percent vs. 11.9 percent. The share of households headed by an immigrant who has not graduated high school using at least one major welfare program is more than two times that of native households overall. And for households headed by immigrants with only a high school education, it is still nearly double the rate for natives overall. But for households headed by immigrants who have at least a bachelor's degree, welfare use is lower than for the overall rate for native households. Table 28 indicates just what would be expected: The least-educated immigrants do much worse than natives, who are on average more educated. In contrast, the most-educated immigrants do a good deal better than the average native. Table 28 confirms the common sense observation that education is a key determinant of economic outcomes. 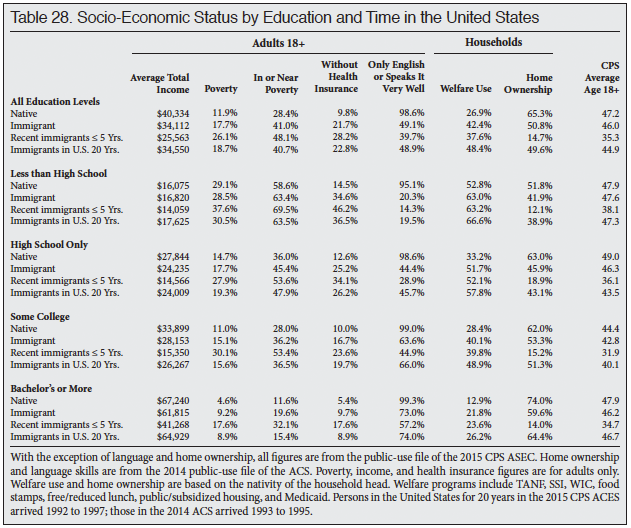 Thus, one of the main reasons immigrants are much poorer than natives on average is that, as shown in Table 27, a much larger share of immigrants have low levels of education. This results in their having much higher rates of poverty, uninsurance, and welfare use and lower income and home ownership. While not surprising, it is very relevant to immigration policy. It means, for example, if we would like immigrants who arrive in the future to have higher incomes and lower poverty and welfare use, then allowing in fewer immigrants who have modest levels of education could do a lot to accomplish that goal. Of course, there are many other competing goals of immigration policy, so creating a more-educated stream of immigrants is only one set of policy options that could be pursued. Immigrants and Native by Education. While the differences in socioeconomic status with natives shown in Table 28 are large, comparing immigrants and natives with the same education shows that, with some exceptions, immigrant adults tend to do somewhat worse. However, the differences within educational categories are, for the most part, not enormous. Equally important, differences by education are much less than are the overall differences between immigrants and natives. For example, the table shows that adult immigrant poverty overall is 17.7 percent, 5.8 percentage points higher than the rate for adult natives overall. But looking at the four educational categories in Table 28 shows an average difference of 2.8 percentage points. Thus it can be said that roughly half the difference in poverty between immigrants and natives is caused by the lower educational attainment of immigrants. Education and Progress over Time. In addition to overall figures, Table 28 provides statistics for immigrants in the country for fewer than five years and for immigrants in the country for 20 years by educational attainment. As already discussed at length in this report, immigrants who have been in the country longer are much better off than newer arrivals. Table 28 shows this is true for all educational categories. Even the least-educated immigrants in the country for 20 years are far better off than their newly arrived counterparts. Income, poverty, home ownership, insurance coverage, and language skills all improve with time. Welfare use is the lone exception. It does not decline with time. Putting aside welfare use, if all that matters is progress over time, then Table 28 shows that progress over time is a characteristic of immigrants, regardless of education. However, Table 28 also shows that the least-educated immigrants who have been in the country for two decades have dramatically higher poverty, uninsurance, and welfare use as well as dramatically lower home ownership and income. The poverty rate for immigrants who lack a high school education and have been in the country for 20 years is more than 2.5 times that of natives and the share in or near poverty is well more than double. Of these least-educated, long-time immigrant residents, 64 percent live in or near poverty. More than a third do not have health insurance and two-thirds use at least one major welfare program. Immigrants with less than a high school education who have been in the country for 20 years are dramatically worse off than natives, even though they are better off than their newly arrived counterparts. The situation is better for those with a high school education who are long-time residents, but the differences with natives are still very large. The average income of those with only a high school education who have been here for 20 years is still only 60 percent that of natives. The share in poverty is 63 percent higher and the share without health insurance is more than two and one half times higher than the average native. Well more than half (58 percent) of households headed by an immigrant with only a high school education who has been in the country for 20 years access the welfare system. Well-established immigrants who have only a high school education are clearly better off than well-established immigrant high school dropouts, but they are still much worse off than the average native. Immigrants with some college who have been in the United States for 20 years are much closer to the average for natives. While income lags that of natives, long-time resident immigrants with some college are similar to natives in poverty and near poverty. Health insurance coverage is still half that of natives and welfare use is also well above that of natives. As for college graduates, the situation is reverse that of the lower educational categories. Immigrants with at least a bachelor's degree who have been in the country for 20 years have much higher incomes than the average native, as well has much lower rates of poverty. Health insurance coverage is similar to natives, as is home ownership. Even newly arrived college graduates are relatively prosperous. Table 28 shows that the average income of immigrant college graduates in the country for five or fewer years is slightly higher than the average for all natives. Poverty tends to be relatively high for newly arrived college graduates, but the share in or near poverty is similar to natives. The results in Table 28 are relevant to immigration policy because they indicate that low socioeconomic status is not always associated with new arrivals. Newly arrived immigrant college graduates do relatively well in the United States. Thus, it is wrong to think that low income or high welfare use is simply unavoidable among new immigrants. The most educated immigrants are relatively prosperous even when they have been in the country for only a few years. That educational attainment matters a great deal to economic success in the United States is expected. The question for policy makers and the public is whether this fact should be given more weight in formulating immigration policy. In this section we examine characteristics of immigrants and natives by state. Consistent with the other tables in this analysis we use the CPS to measure income, poverty, health insurance, and welfare use. In order to obtain more statistically robust estimates at the state level we use a combined two-year sample of the March CPS 2014-2015. Elsewhere in this Backgrounder, such as in Tables 10, 11, 12, and 26, we examined these and other issues at the national level based on only the March 2015 CPS. Thus, the national totals in the earlier tables will not exactly match the national totals found in the state tables. However, the differences between the national figures using only the 2015 CPS and a combined two-year sample are quite small. The state figures for educational attainment, public school enrollment, home ownership, and household crowding are based on the 2014 ACS and will match national totals found elsewhere in this report. The difference in median household income between immigrant and native households tends to be much larger when divided by household size to create per capita median incomes. (Per capita median income is calculated by dividing total household income by the number of people in the household.) Even in Georgia and Virginia the per capita median income of immigrant households is 20 percent and 39 percent lower, respectively, than that of natives. In some states the difference with natives is much larger. In Arizona, Colorado, Texas, California, Nevada, North Carolina, New Jersey, Minnesota, New York, Washington, and Massachusetts the per capita household income of natives is at least 50 percent higher than that of immigrants. The per capita figures indicate that immigrant households are a good deal poorer than native household once household size is taken into account. The last two columns in Table 29 show the share of immigrant and native households that are owner-occupied. In nine of the top immigrant receiving states the gap between immigrant and native home ownership is 10 percentage points or more. However, it is interesting to note that in Nevada and Arizona, where immigrant household income tends to be lower than native households, and as we will see poverty and welfare use tend to be much higher, home owner¬ship rates are much closer than in many of the other top immigrant-receiving states. Public Schools. Immigration has a very significant impact on public schools in many states. 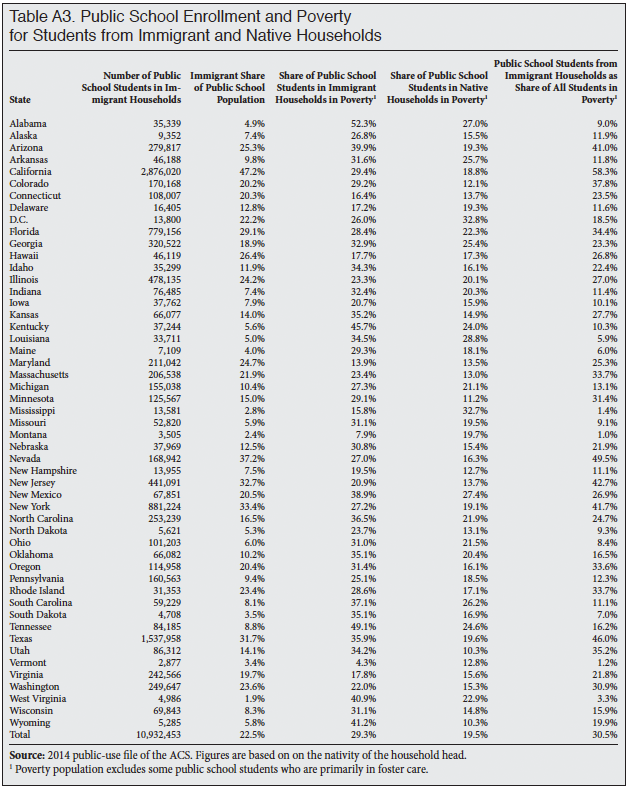 Table A3 in the appendix shows the number of public school students from immigrant and native households in all 50 states and the District of Columbia. Immigrants comprised the largest share of public school students in California, Nevada, New York, Texas, New Jersey, Florida, Hawaii, and Arizona. In these states more than one in four primary and secondary public school students is from an immigrant household. Table A3 also shows the share of public school students in immigrant and native households in poverty. Nationally, 29.3 percent of public school students from immigrant households are in poverty. Of all public school students in poverty, 30.5 percent are from immigrant households. In California, 58.3 percent of public school students in poverty are from immigrant households, as are 49.5 percent in Nevada, 46 percent in Texas, and 42.7 percent in New Jersey. Even in some states not traditionally thought of as being heavily impacted by immigration, a very large share of public school students in poverty come from immigrant households. For example, 33.7 percent of public school students in Rhode Island in poverty are from immigrant households, as are 35.2 percent in Utah, and 31.4 percent in Minnesota. Immigration has had a very large impact on the number of low-income public school students in the country and in many states. 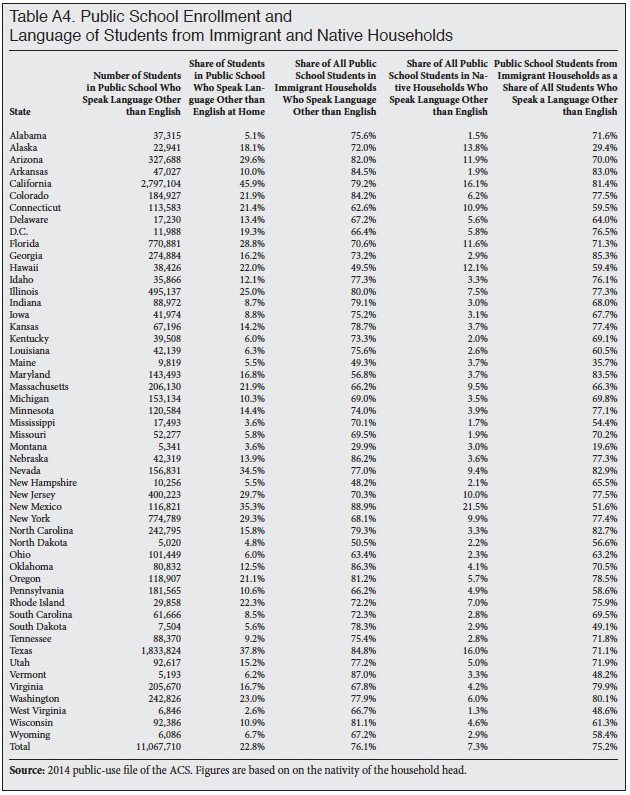 Table A4 in the appendix shows the number and share of public school students by state who speak a langue other than English. In 16 states, one out of five students lives in a household where a language other than English is spoken at home. In California and Texas, 46 percent and 38 percent, respectively, of all public school students live in such households. This does not necessarily mean that all of these students do not speak English well. But it does mean that school systems across the country will have to provide appropriate language instruction for some significant share of these students. Tables A3 and A4 show that immigration has added a very large number of students to the public school system, many of whom speak a language other than English. Table A5 in the appendix shows the average number of students per 100 households for all 50 states plus the District of Columbia. Like the national numbers already shown in Table 20, in almost every state there are many more public school students per immigrant household than per native household. In fact, Table A5 shows that in 32 states (including the District of Columbia) the number of students per immigrant household is 50 percent larger than for native households. Among the top immigrant-receiving states, in North Carolina, Colorado, and Nevada the number of public school student per immigrant household is over twice that of native households. Table 29 shows that immigrant household income tends to be a good deal less than native household income for most of the top immigrant-receiving states. For example, in Arizona the median household income of immigrant households is 86 percent less than that of native households and the mean household income is 70 percent less. Table A5 shows that immigrant households have 83 percent more public school students than native-headed households in Arizona. Even in Georgia, where immigrant household income is slightly higher than native household income, the average immigrant household still has 91 percent more public school students compared to native households. Since households are the primary unit by which taxes are assessed and collected, the relatively low income of immigrant households coupled with the much greater demand they create for public education means that in many parts of the country there will be a significant increase in school enrollment without a corresponding increase in the local tax base. Overcrowded Households. 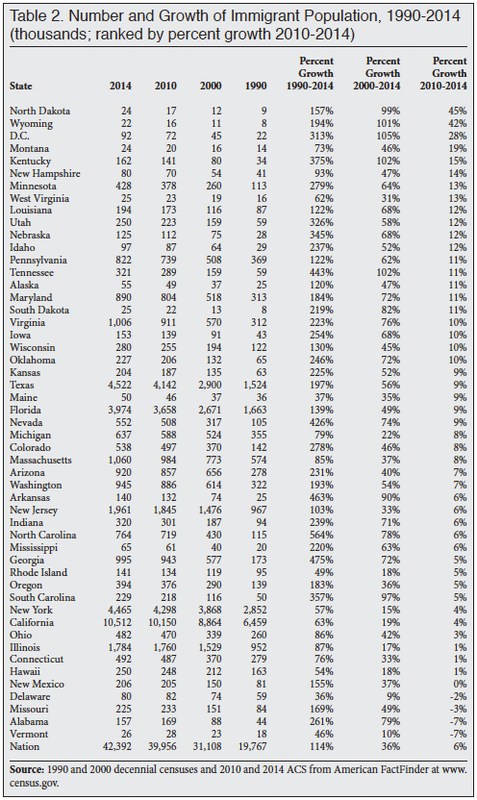 Table A6 in the appendix shows household overcrowding by state. Table A6 shows household crowding is much more common among immigrant households than native households — 11.6 percent vs. 1.9 percent. Because overcrowding is so much more common among immigrant households, they account for a much larger share of all overcrowded households. As Table A6 shows, nationally 14.6 percent of all households are headed by an immigrant, yet immigrant-headed households account for 51 percent of all overcrowded households. In California, immigrant households account for 69.2 percent of all overcrowded households, even though they are 32.5 percent of all households. It may not be surprising that immigrant households account for a very large share of overcrowded households in states such as New York (65.8 percent), New Jersey (64.5 percent), Texas (53.3 percent), Nevada (54.9 percent), and Arizona (42 percent). What is more surprising is that they are 56.8 percent of overcrowded households in Maryland, 43.9 percent in Nebraska, and 52.6 percent in Minnesota. Immigration has added significantly to the stock of overcrowded households in many states, including some that are not traditionally seen as heavily impacted by immigration. In all, immigrant households account for one-third or more of overcrowded households in 24 states plus the District of Columbia. Poverty and Near Poverty by State. 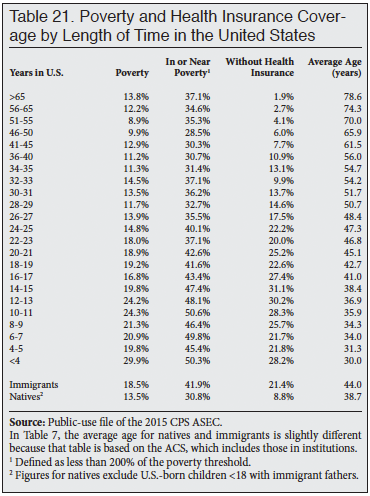 Table 30 reports the percentage and number of immigrants and their U.S.-born children who live in poverty compared to natives and their children. As in the other tables in this report, the figures for immigrants include the U.S.-born minor children (under age 18) of immigrant fathers. While the foreign-born tend to have much higher poverty rates in the top receiving states, in Nevada, Maryland, and Illinois in particular the difference with natives is not that large. In contrast, immigrants and their children tend to have much higher rates of poverty in Arizona, Colorado, Minnesota, North Carolina, and Texas. 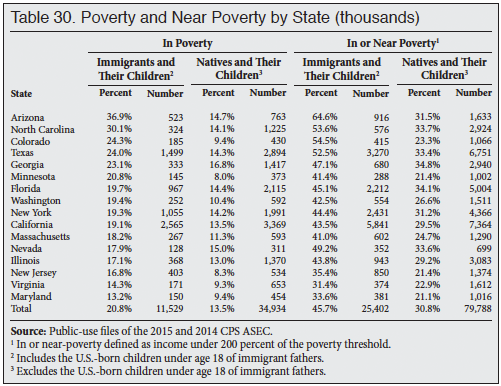 Turning to the share in or near poverty, (defined as below 200 percent of the poverty threshold), with the exception of Virginia, immigrants and their young children have much higher rates of poverty/near poverty than natives in the top states of immigrant settlement. As already discussed, those with incomes below this amount usually do not pay income taxes, and they typically become eligible for means-tested programs. Health Insurance Coverage by State. 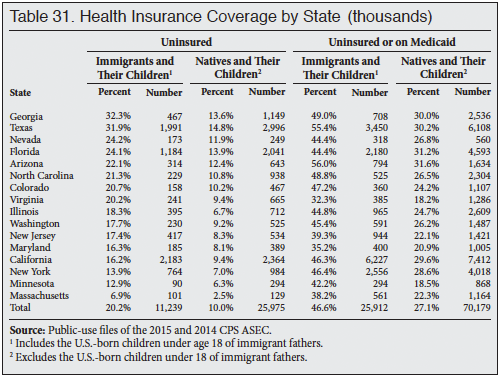 Table 31 shows the share of immigrants and their children without health insurance by state. With the exception of Massachusetts, the difference between immigrant and native insurance coverage rates is large. Excluding Massachusetts, in 9 of the states, immigrant rates of uninsurance are double those of natives. The impact of immigration on the health care system as a whole can also be seen when we consider the share of immigrants and their minor children who are either uninsured or enrolled in Medicaid, which is shown in the last columns of Table 31. Based on the 2014-2015 CPS, the share of immigrants and their children on Medicaid or without health insurance is 47 percent.55 In comparison, 27 percent of natives and their young children are uninsured or on Medicaid. In Texas and Arizona, more than half of immigrants and their children are uninsured or on Medicaid. Excluding Massachusetts, in nine of the states over 40 percent of immigrants and their children are either uninsured or on Medicaid. The impact of immigration on the health care system in these states and the nation is clearly very large. It is worth noting that by subtracting the share on Medicaid or uninsured from the share who are uninsured the percentage on Medicaid alone can be calculated. In all of the states listed in Table 31, immigrants and their children are more likely to be on Medicaid than natives and their children. Earlier in this report we observed that immigration has a very large impact on the nation's health care system. 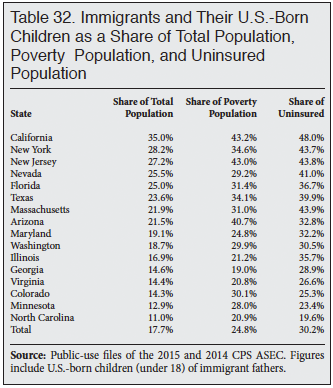 Table 32 shows the share of each state's population comprised of immigrants and their minor children and their share of the uninsured and those in poverty. The table reads as follows: Immigrants and their minor children comprise 35 percent of California's overall population and they are 43 percent of those in poverty. They are also 48 percent of the uninsured in the Golden State. Table 32 shows that immigrants tend to be a much larger share of the poor and uninsured in these states than they are of the overall population. Welfare Use by State. Table 33 shows the percentage of immigrant- and native-headed households using at least one major welfare program. Programs included are TANF, SSI, general assistance, food stamps, WIC, free/subsidized school lunch, public/rent subsidized housing, and Medicaid. As we saw in Table 12, the biggest difference in program use is for Medicaid and food assistance programs. For state governments, Medicaid is a particular concern because between one-third to one-half of the program's costs are typically borne by state taxpayers. The largest percentage-point differences in overall welfare use for immigrant and native welfare use are found in Minnesota, Colorado, Arizona, North Carolina, and Massachusetts. The smallest differences are in Georgia and Virginia. Estimated State and Federal Income Tax. In addition to welfare use, Table 33 also shows estimated income tax payments for immigrant and native households. Based on the characteristics of immigrant families and individuals, the Census Bureau estimates tax liability. That is, what should be paid in income taxes given income, dependents, home ownership, etc. This estimate does not have any information about tax compliance. It is only an estimate of what should be paid if the law is followed. Figures for state and federal tax are shown in the far right of Table 33. In terms of state income tax, native households have higher tax liability than immigrants in every state but North Carolina. But the differences are not that large in some states. In terms of federal income tax, the difference with natives is much larger. On average, native households have federal income tax liability that is 56 percent higher. This report has shown that immigrant households have higher rates of welfare use and public school enrollment. And immigrants and their children are much more likely to lack health insurance. Perhaps most important, immigrant households are much larger on average than native households. These facts coupled with lower average income tax liability raise the clear possibility that immigrant households are a significant net fiscal drain. However, several things must be kept in mind. First, the tax estimates are not actual tax payments or even self-reported tax payments; they are Census Bureau derived estimates. Tax compliance rates are likely to differ significantly for immigrant and native households, particularly for illegal immigrant households, which are included in the data. Second, state and federal income taxes are not the only taxes collected by government. Third, welfare and education are by no means the only sources of expenditures for states or the federal government. In short, the tax estimates and the other information in this report are not a balance sheet of taxes vs. expenditures. But the information is consistent with the very real possibility that immigrant households are on balance a net fiscal drain. Education Levels by State. 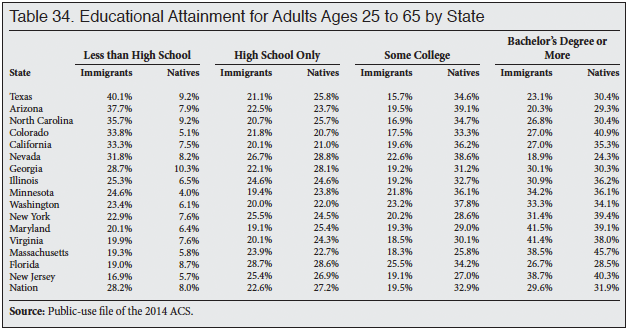 Table 34 shows the education level of immigrants and natives (ages 25 to 65) in the top immigrant-receiving states. As has already been discussed at length, a much larger share of immigrants have not completed high school compared to natives. This is also the case in every state in Table 34. The largest percentage-point difference is in Texas, followed by Arizona, Colorado, North Carolina, California, and Nevada. The gap is smallest in Florida, New Jersey, Virginia, Massachusetts, Maryland, and New York. At the high end of the educational distribution the situation is somewhat different. In states such as Colorado, Arizona, and California immigrants are much less likely to have at least a bachelor's degree. However, in a number of states immigrants are as likely or even more likely to have completed college, including Virginia, Maryland, Georgia, Washington, New Jersey, and Florida. Looking back on Tables 29 to 33, they show that in general states where immigrant educational attainment is lowest relative to natives the gap with natives in socioeconomic status tends to be the highest. In contrast, where immigrants are more educated, the gap is much smaller. State Workforce. Table 35 shows workforce characteristics by state. The first column shows the number of immigrant workers in each state in 2014-2015. The second column shows the number of immigrant workers in the state who arrived in 2000 or later. The third column shows the share of all workers in the state who are foreign-born. Thus, the table reads as follows: Based on 2014 and 2015 data, there were 5,874,000 immigrant workers in California, 1,802,000 of whom arrived in 2000 or later. Overall, 33.4 percent of all workers in the state were immigrants. The fourth column shows the number of natives (18 to 65) not working, the fifth column shows the percentage of natives (18 to 65) working in 2014-15, and the sixth column shows the share of natives (18 to 65) working back in 2000-01. Thus, in California 5,546,000 natives ages 18 to 65 were not working in 2014-2015. Overall, 66.7 percent of natives in this age group held a job. The sixth column shows that for California at the beginning of the last decade, 74.1 percent of natives in this age group worked. The last three columns in the table show the same information as columns four, five, and six, except that the figures are only for young natives (18 to 29) with no more than a high school education. This includes high school dropouts and those who have graduated high school but have no additional schooling. They are reported separately because they are the group most likely to be in competition with immigrants for jobs at the bottom end of the labor market. 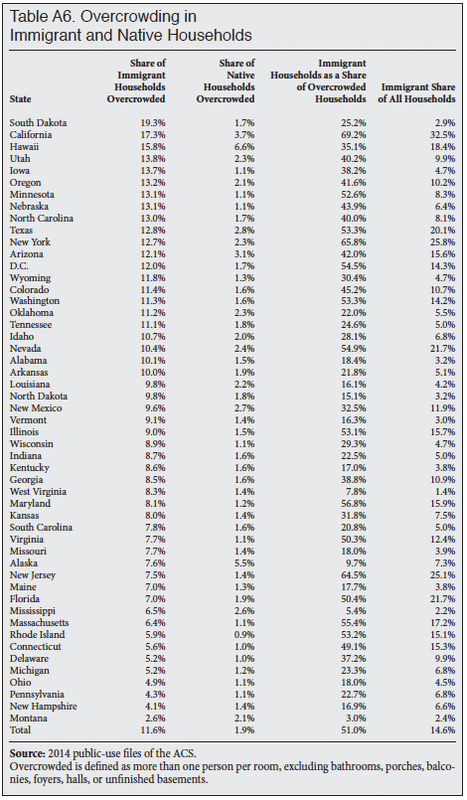 Table 35 shows that immigrants make up a large share of workers in almost all of these states. In California, immigrants are more than a third of workers, and they are roughly a quarter of all workers in New Jersey, New York, Nevada, and Florida and about a fifth of workers in Texas, Massachusetts, Maryland, and Arizona. The table also shows that in all of these states there are very large populations of working-age native-born people who are not employed. For example, in California, New Jersey, New York, Nevada, Florida, Texas, Maryland, Arizona, Washington, Massachusetts, and Illinois there are more than one million working-age natives not employed. If we compare the number of natives not working to the number of post-2000 immigrants it shows that in almost every state the number of natives (18 to 65) not working is at least three times the number of newly arrived immigrants. And in many states the ratio is even larger. Those who are not working are either unemployed, which means they have looked for a job in the last four months, or they are not looking for work. In total there are 29.4 million adult working-age (18 to 65) natives not employed in the 16 states shown in Table 35. There are an additional 21.3 million working-age natives not working in other states. Of those who are not employed, some are discouraged workers who would like to work but have not looked in the last four weeks and so are not counted as officially unemployed. Some of those not working are disabled, some are parents taking care of young children, and others are college students who could work but do not wish to do so. (There are virtually no college students in columns 7, 8, and 9 at the right of Table 35 because those attending college have at least some education beyond high school, and are therefore not included.) It would be a mistake to think that all of those not working want to work or are even able to do so. But even if only one in five of the 50.7 million working age natives not employed got a job, it would be larger than the almost 10 million new immigrant workers added in the last 14 years. Put a different way, if employment rates nationally for working-age natives simply returned to 2000-2001 levels (75.2 percent), then 9.8 million more natives would be working in 2014-2015. The starkest finding in Table 35 is the dramatic deterioration in the employment rate of working-age natives. On average, their employment rates are almost six percentage points lower in 2014-2015 in these states than they were in 2000-2001. This is a very large decline because, unlike unemployment rates, employment rates do not swing dramatically. A six percentage-point decline is a very large change. Even more striking is the decline in the employment rate of young (18 to 29) less-educated natives. On average, the share holding a job in this group is almost 12 percentage points lower in these states in 2014-2015 than in 2000-2001. Employment rates were already relatively low for this group, so the decline is that much more disconcerting. In Arizona, North Carolina, and California fewer than half of these individuals had a job in 2014 and 2015. In these same states, in 2000 and 2001 roughly two-thirds of this demographic held a job. Although not shown in Table 35, the dramatic deterioration in employment among natives began before the recession. The share of 18- to 65-year-olds working was 72.9 percent in 2006/2007, lower than the 75.2 percent at the start of the decade, even though March of 2006/2007 represents the peak of the last economic expansion. More striking, the share of young, less-educated natives working was 61.1 percent in the 2006/2007 period, compared to 65.9 at the start of the decade. Clearly the current downturn caused a massive decline in work among this population. But, the decline began well before the Great Recession. Table 35 shows that immigrants comprise a large share of workers in many states. But these same states also have very large numbers of native-born people not holding a job. If immigration is curtailed in the future, there certainly seems to be a very large pool of potential workers for employers to draw upon. Of course, as mentioned above, many people not working do not wish to work. But again, if employment rates nationally for working-age natives simply returned to 2000-2001 levels, then 10 million more natives would be working, which is more than all of the new immigrant workers allowed into the country in the prior 14 years — legally and illegally. The latest data collected by the Census Bureau shows that 18.7 million immigrants arrived in the country from 2000 to 2014. Just between 2010 and 2014, 5.6 million immigrant arrived in the United States. The more than one million immigrants settling in the country each year have a very significant effect on many areas of American life. New immigration plus births to immigrants added more than eight million people to the U.S. population between 2010 and 2014, accounting for the overwhelming majority of population growth. Immigrants account for more than one in eight U.S. residents. Children from immigrant households now account for nearly one in four public school students, almost one-third of children in poverty, and one-third without health insurance, creating enormous challenges for the nation's schools, health care system, and physical infrastructure. The large share of immigrants who arrive as adults with relatively few years of schooling is the primary reason so many live in poverty, use welfare programs, and lack health insurance. Despite the fact that a large share of immigrants have few years of schooling and low incomes, most immigrants do work. In fact, the share of immigrant men holding a job is higher than native-born men, though the share among women is lower. Moreover, the evidence examined in this report and other research makes clear that immigrants make significant progress the longer they reside in the United States. This is even true for the least educated. Unfortunately, this progress still leaves them on average well behind natives in most measures of socio-economic status even after they have been in the United States for decades. The share of adult immigrants who have lived in the United States for 20 years who are in poverty or lacking health insurance is at least 50 percent higher than for adult natives. And the share of households headed by long-time immigrant residents using one or more welfare programs is nearly twice that of native households. At the same time that immigration policy has significantly increased the number of immigrant workers, especially those with modest levels of education, there has been a significant decline in the share of natives holding jobs, particularly among the less-educated. Data from 2000/2001 shows 66 percent of young natives with no education beyond high school held a job; in 2014/2015 it was just 53 percent. It is very difficult to find any evidence of a shortage of less-educated workers in the United States. Some may argue that immigrants only do jobs that American do not want, but an analysis by occupations shows that the vast majority of workers in almost every job are U.S-born, including three-fourths of janitors and about two-thirds of construction labors and meat processors. A central question for immigration policy is: Should we continue to allow in so many people with little education — increasing potential job competition for the poorest American workers and growing the population in need of government assistance? Setting aside the lower socioeconomic status of immigrants, no nation has ever attempted to incorporate nearly 60 million newcomers and their young children. Those concerned about sprawl, traffic, pollution, and how these things impact the quality life in the United States argue that an ever larger population caused by U.S. immigration is contributing to these problems. Supporters of population growth, on the other hand, argue that it may create greater opportunities for businesses, workers, and consumers. However one approaches population increase, it is clear that immigration has become the determinant factor in U.S. population growth. While there is no question that immigration has an enormous impact on the future size of the population, it is equally clear that immigration does not make the nation significantly more youthful. In 2014, 13 percent of both immigrants and natives are of over age 65. As we also show, excluding all 17.3 million immigrants living in the country in 2014 who arrived in 2000 or later plus all their U.S.-born children has little impact on the nation's age structure. Whatever one's view of immigration, it is important to understand that its effect on America represents a choice. Selection criteria can be altered, as can the total number of people allowed into the country legally. Moreover, the level of resources devoted to reducing illegal immigration can also be reduced or increased. The goal of this Backgrounder has been to provide information about the impact of immigration on American society to better inform the policy discussion about what kind of immigration policy should be adopted in the future. Absent a change in policy, 12 to 15 million additional legal and illegal immigrants will likely settle in the United States in just the next 10 years. Thus, immigration's impact will continue to grow if current trends are allowed to continue. 1 The Census Bureau projects that from 2016 to 2025 net immigration (the difference between the number coming and going) will total 12.8 million. It also projects that by 2035 net immigration will total 26.3 million. The number of new arrivals will be higher as several hundred thousand immigrants return to their home countries each year. See Table 1 of the Census Bureau National Population Projections from 2014. 2 In 2014, the Census Bureau implemented changes to the CPS designed primarily to better capture income. The 2014 data includes the old questions for 5/8 of the sample, while 3/8 of the sample used the new questions that are compatible with the 2015 CPS. 3 "Immigrant" does not include those born abroad of American parents or those born in outlying territories of the United States such as Puerto Rico. 4 The survey questions are complex and having a live person ask the questions almost certainly improves data quality. In contrast, most respondents to the ACS mail in their questionnaire and never actually speak to a Census Bureau employee. Moreover, respondents remain in the CPS for several months at a time and this, too, means that a relationship with the Bureau is developed during the time the household is surveyed. 5 For the post-1980 immigrant population, the Department of Homeland Security estimates a 5 percent undercount in the CPS. See DHS publication: "Estimates of the Unauthorized Immigrant Population Residing in the United States: January 2011". The Pew Hispanic Center comes to a similar conclusion in their analysis of the Current Population Survey. See "Trends in Unauthorized Immigration: Undocumented Inflow Now Trails Legal Inflow", October 2008. 6 Bryan Baker and Nancy Rytin, "Estimates of the Unauthorized Immigrant Population Residing in the United States: January 2013", Department of Homeland Security, March 2013. 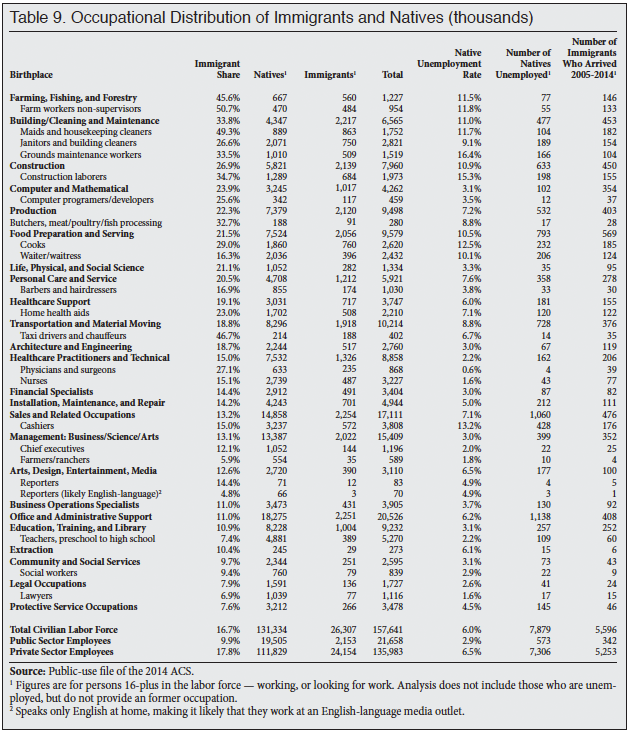 Table 2 shows a 1.85 million undercount among post-1980 immigrants in the 2011 ACS. This is equal to about 5 percent of the post-2011 foreign-born population. 7 In 1890, the immigrant share was 14.77 percent and in 1910 the figure was 14.70 percent. See Campbell Gibson and Kay Jung, "Historical Census Statistics on the Foreign-Born Population of the United States: 1850-2000", Census Bureau Population Division Working Paper No. 81, February 2006. In 2023 the Census projects the foreign-born share of the population will be 14.79 percent. The projections also indicate that the share will continue to increase, reaching 15.82 percent by 2030, 17.13 percent by 2040, and 18.77 percent by 2060. See Table 2 of the Census Bureau National Population Projections from 2014. 8 The figures for total immigrant population in 2000 are from the decennial census, not the ACS, because the Census is generally considered a better source of data on the foreign-born for that year. 9 See for example, Steven A. Camarota, "Immigration and Economic Stagnation: An Examination of Trends 2000 to 2010", Center for Immigration Studies Backgrounder, November 2010. See also Steven A. Camarota, "Homeward Bound: Recent Immigration Enforcement and the Decline in the Illegal Alien Population", Center for Immigration Studies Backgrounder, July 2008; and Steven A. Camarota and Karen Zeigler, "A Shifting Tide: Recent Trends in the Illegal Immigrant Population", Center for Immigration Studies Backgrounder, July 2009. 10 It may also be worth pointing out some seeming incongruity in the Census Bureau data itself reported in Figures 2 and 3. At times during the last 14 years, growth in the foreign-born population relative to new arrivals seems to be out of line. There are breaks in the continuity of the ACS data due to changes in weighting and the full implementation of the survey. Nevertheless, even taking into account the discontinuity in the data, it is difficult to reconcile some of the results in Figures 2 and 3. For example, new arrivals were very high in 2000 based on the year of arrival data (Figure 3) from the 2001 ACS, but there is little growth in foreign-born between 2000 and 2001 (Figure 2). However, the 2000 total foreign-born number is from the decennial Census, while the 2001 total and the arrival data for that year are from the ACS. The ACS was not fully implemented in 2001, and the survey differs from the Census in other ways that may explain why high levels of new immigration in 2000 did not produce high growth in the immigrant population. Another seeming incongruity is the high growth from 2004 to 2005 of 1.4 million even though new arrivals in 2004 were 1.35 million. However, it must be remembered that the ACS reflects a July 1 estimate of the U.S. population, including the foreign-born. So individual year-of-arrival data, which corresponds to calendar year, does not directly compare to growth from July 1 to July 1 of each year. Moreover, the ACS was not fully implemented until 2005 and individuals in group quarters were not included in the ACS until 2006. These factors also impact year-over-year comparisons. All of these issues create important breaks in the continuity of the data. Finally, we are not sure how immigrants returning to the United States after spending time outside of the country respond to year-of-arrival question. This "re-immigration" adds further ambiguity to any analysis using the year-of-arrival question. 11 For example, an immigrant who came in 1995, went home in 2008, and returned in 2011 might report their year of arrival as 1995. In this circumstance they could contribute to growth in the immigrant population without showing up as a new arrival. 12 Because the public-use ACS file reports individual year of arrival, it is a straightforward matter to calculate the average length of time immigrants have been in the country in 2014. 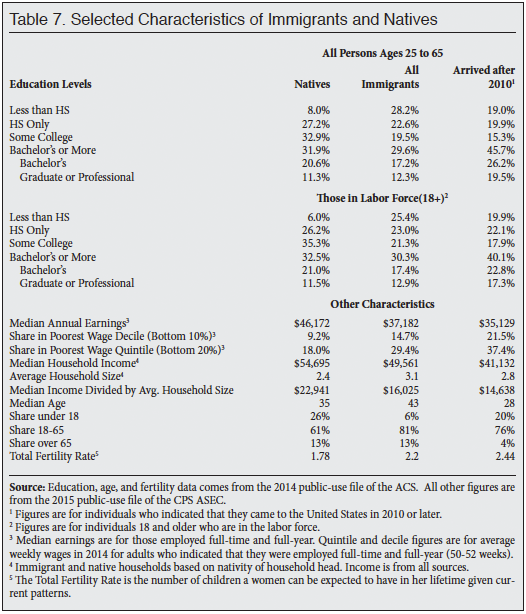 13 The figures for Tables 3 and 4 come from a Center for Immigration Studies analysis of the 2014 public-use file of the American Community Survey, which shows 42,235,749 immigrants. However, the public-use ACS, while designed to be representative of the ACS data used internally by the Census Bureau, the source for American FactFinder, does not exactly match the internal file, hence the 156,000 (0.37 percent) difference in the totals found in Tables 1, 2, 3, 4, and 5. 14 Countries that can be identified in the public-use 2014 ACS file and for which there were actually respondents by region are as follows: Central America: Belize, Costa Rica, El Salvador, Guatemala, Honduras, Nicaragua, and Panama. South America: Argentina, Bolivia, Brazil, Chile, Colombia, Ecuador, Guyana, Paraguay, Peru, Uruguay, Venezuela, and South America not specified. South Asia: Afghanistan, India, Bangladesh, Pakistan, Sri Lanka, Bhutan, and Nepal. East Asia: China, Hong Kong, Taiwan, Japan, Korea, Cambodia, Indonesia, Laos, Malaysia, Philippines, Singapore, Thailand, Vietnam, Burma, Asia not specified. Europe: Denmark, Finland, Iceland, Norway, Sweden, England, Scotland, United Kingdom, Ireland, Belgium, France, Netherlands, Switzerland, Albania, Greece, Macedonia, Italy, Portugal, Azores, Spain, Austria, Bulgaria, Czechoslovakia, Slovakia, Czech Republic, Germany, Hungary, Poland, Romania, Yugoslavia, Croatia, Bosnia, Serbia, Montenegro, Cyprus, Latvia, Lithuania, Byelorussia, Moldova, Ukraine, Armenia, Georgia, Russia, USSR not specified, and Europe not specified. Caribbean: Bermuda, Cuba, Dominican Republic, Haiti, Jamaica, Antigua-Barbuda, Bahamas, Barbados, Dominica, Grenada, St. Lucia, St. Vincent, Trinidad and Tobago, and Caribbean and West Indies and Americas not specified. Middle East: Azerbaijan, Kazakhstan, Uzbekistan, Iran, Iraq, Israel/Palestine, Jordan, Kuwait, Lebanon, Saudi Arabia, United Arab Emirates, Syria, Turkey, Yemen, Algeria, Egypt, Morocco, Libya, Sudan, and North Africa not specified. Sub-Saharan Africa: Cape Verde, Ghana, Guinea, Liberia, Nigeria, Senegal, Sierra Leone, Ethiopia, Kenya, Somalia, Tanzania, Uganda, Zimbabwe, Eritrea, Cameroon, South Africa, Zaire, Congo, Zambia, Togo, Gambia, and Africa and Western and Eastern Africa not specified. 15 This number is different from the 5.6 million arrivals shown in Figure 3 because 5.2 million represents the number who arrived and are still in the country in 2014. 16 Using the characteristics of the household head and the children's age, we estimate based on the ACS that there were 3.608 million children born in the United States to immigrants over this time period. Of these births, 206,258 were to an immigrant who arrived in 2010 or later. All of these children were living in the United States in 2014. 17 It may also be helpful to think about the limitations of using just growth in the immigrant population by considering the fact that if one million immigrants enter the country each year, at some point one million immigrants will eventually die a year, assuming no out-migration. This would mean that the arrival of one million new immigrants roughly equaled deaths and thus there is no growth in the foreign-born population. But of course the U.S. population would in fact be much larger with the arrival of one million new immigrants regardless of mortality. 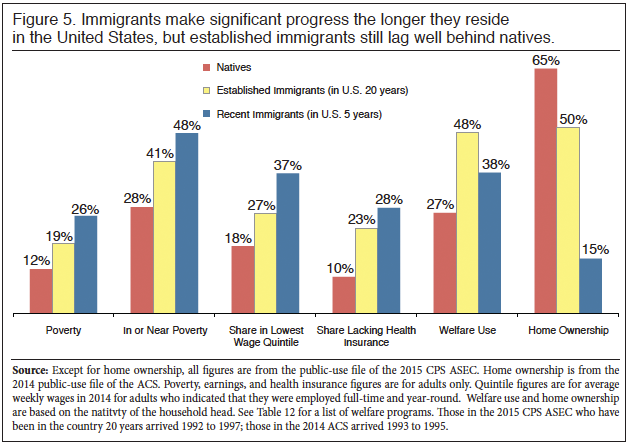 18 For a discussion of the decline in immigrant education relative to natives, see Steven A. Camarota, "The Slowing Progress of Immigrants: An Examination of Income, Home Ownership, and Citizenship, 1970-2000", Center for Immigration Studies Backgrounder, March 2001. 19 This figure refers to persons aged 18 or older who are in the workforce. To be in the workforce one has to be either employed or actively looking for work. Persons not working but actively looking for work are considered unemployed. 20 The median figures in Table 7 and all subsequent tables, including those for households, are calculated using the Census Bureau method of grouping data into $2,500 cells. While the median figures in this Backgrounder very closely match median figures published by the Census Bureau, they may not exactly match in all cases because the bureau re-codes income figures in the public-use file of the CPS in order to protect anonymity. 21 Of the 11.8 million children born to immigrants between 2000 and 2014, 3.9 million were births to immigrants who actually arrived in the is time period. The remainder of the births were to immigrants who arrived earlier. All figures are for those born to immigrants in the United States who were in the country in 2014. 22 It should be noted that the public-use file of the ACS only provides ages as a whole number, no decimals or months are provided. Perhaps if age was reported in more detail, it would make a larger difference in median age. 23 For a more technical definition of the Total Fertility Rate see United Nations Statistics Division definition of TFR. 24 The TFR for natives is actually 1.778, and the overall TFR is actually 1.854, so the difference is .08. 25 Carl P. Schmertmann, "Immigrants' Ages and the Structure of Stationary Populations with Below-Replacement Fertility", Demography, Vol. 29, No. 4, November 1992. 26 The 2000 Census Bureau population projections mentioned above can be found here. 28 It should be noted that the unemployment rate cannot be calculated by comparing the difference between those with a job and those in the labor force because the Bureau of Labor Statistics calculates unemployment by dividing those actively looking for a job by the labor force. In contrast, the share holding a job or the share in the labor force are based on the entire 18- to 65-year-old population. 29 Like official U.S. government poverty statistics, the poverty statistics in this report do not include persons under age 15 unrelated to the household's head. This excludes about 400,000 children, who are mostly in foster care. 30 Figures for natives exclude the young (under 18) U.S.-born children of immigrant fathers. 31 Countries that can be identified in the public-use 2015 CPS ASEC and for which there were actually respondents by region are as follows: Central America: Belize, Costa Rica, El Salvador, Guatemala, Honduras, Nicaragua, Panama. South America: Argentina, Bolivia, Brazil, Chile, Colombia, Ecuador, Guyana, Paraguay, Peru, Uruguay, Venezuela, South America not specified. South Asia: Afghanistan, Bangladesh, Bhutan, India, Nepal, Pakistan, Sri Lanka. East Asia: Myanmar (Burma), Cambodia, China, Hong Kong, Indonesia, Japan, Korea, South Korea, Laos, Malaysia, Mongolia, Philippines, Singapore, Taiwan, Thailand, Vietnam, Asia not specified. Europe: Albania, Austria, Belgium, Bulgaria, Czechoslovakia, Denmark, Finland, France, Germany, Greece, Hungary, Iceland, Ireland, Italy, Netherlands, Norway, Poland, Portugal, Azores, Romania, Spain, Sweden, Switzerland, United Kingdom, England, Scotland, Northern Ireland, Yugoslavia, Czech Republic, Slovakia, Bosnia & Herzegovina, Croatia, Macedonia, Serbia, Estonia, Latvia, Lithuania, Armenia, Belarus, Georgia, Moldova, Russia, Ukraine, USSR, Montenegro, Europe not specified. Caribbean: Bermuda, Antigua and Barbuda, Bahamas, Barbados, Cuba, Dominica, Dominican Republic, Grenada, Haiti, Jamaica, St. Kitts-Nevis, St. Lucia, St. Vincent and the Grenadines, Trinidad and Tobago, West Indies not specified. Middle East: Azerbaijan, Iran, Iraq, Israel, Jordan, Kazakhstan, Kuwait, Lebanon, Saudi Arabia, Syria, Turkey, United Arab Emirates, Uzbekistan, Yemen, Algeria, Egypt, Libya, Morocco, Sudan. Sub-Saharan Africa: Cameroon, Cape Verde, Congo, Ethiopia, Eritrea, Ghana, Guinea, Ivory Coast, Kenya, Liberia, Nigeria, Senegal, Sierra Leone, Somalia, South Africa, Tanzania, Togo, Uganda, Zaire, Zambia, Zimbabwe, Africa Not Specified. 32 See Sarita A. Mohanty, Steffie Woolhandler, David U. Himmelstein, Susmita Pati, Olveen Carrasquillo, and David H. Bor, "Health Care Expenditures of Immigrants in the United States: A Nationally Representative Analysis", American Journal of Public Health, Vol. 95, No. 8, August 2005. 33 Steven A. Camarota, "Immigrants in the United States A Profile of America's Foreign-Born Population", Center for Immigration Studies Backgrounder, 2012, p. 29. 34 Figures for immigrants include the U.S.-born child (under 18) of immigrant fathers. Figures for natives exclude these children. 35 See, for example, Figures 20-1, 20-2, and 20-3 in Dianne A. Schmidley, "Profiles of the Foreign-born Population in the United States 2000", U.S. Census Bureau, Series P23-206, December 2001. 36 John L. Czajka and Gabrielle Denmead, "Income Data for Policy Analysis: A Comparative Assessment of Eight Surveys", prepared for Office of the Assistant Secretary for Planning and Evaluation (ASPE) and U.S. Department of Health and Human Services (HHS), December 2008. 37 Laura Wheaton, "Underreporting of Means-Tested Transfer Programs in the CPS and SIPP", Proceedings of the American Statistical Association, Social Statistics Section, 2007. Jamie Rubenstein Taber and Brett O'Hara, "The Case of the Missing Medicaid Enrollees: Identifying the Magnitude and Causes of the Medicaid Undercount in the SIPP", U.S. Census Bureau paper presented at the annual APPAM conference, 2014. 38 Steven A. Camarota, "Welfare Use by Immigrant and Native Households", Center for Immigration Studies Backgrounder, September 2015. See Table A1. 39 The Additional Child Tax Credit can also be referred to as the refundable portion of the Child Tax Credit. Table 12 reports those who are eligible for cash from the government, not just a refund of money they paid as taxes. 41 See Kevin S. Blake, Rebecca L. Kellerson, and Aleksandra Simic, "Measuring Overcrowding in Housing", prepared for the U.S. Department of Housing and Urban Development Office of Policy Development and Research, 2007. It is worth noting that, for reasons that are not entirely clear, there has been a significant decline in household overcrowding. There is debate about how much of this decline is due to changes in data collection and how much is a real decline. But this issue does not affect the analysis in this report because we are only examining figures for a single year. 42 To calculate household size we exclude all those in group quarters such as prisons, nursing homes, and college dorms. 43 Calculations of home ownership exclude those in group quarters. 44 All immigrants in the ACS are asked what year they came to the United States. For the purposes of this analysis, 20 years is defined in the 2014 ACS as having entered the country in 1993, 1994, or 1995. We average three years together in order to obtain a more robust estimate. 45 The March Current Population Survey (CPS) from 2014 shows that 22.5 percent of school-age children have an immigrant father and the March CPS for 2015 shows 22.9 percent of the school-age population has an immigrant father. Both the ACS and CPS produce very similar results; however we use the ACS because, unlike the March CPS, it distinguishes between public and private school. Another advantage of the ACS is that it includes a question on language that is an important issue in public education. 46 As is the case in other tables, the figures for natives exclude the U.S.-born children under age 18 of immigrant fathers. 47 Poverty, earnings, health insurance, and welfare use are based on the March 2015 CPS. Those in the country five or fewer years arrived in 2010 or later. Those in the United States for 20 years in 2015 arrived from 1992 to 1997. By 2015, on average these immigrants have lived in the United States for 20.4 years. As already discussed, respondents are grouped by multiple-year cohorts of arrival by the Census Bureau in the public-use file. There is no way in the public-use CPS to look at only those who arrived in 1995 who would have been in the country for 20 years exactly in 2015. Looking at immigrants who arrived 1992 to 1997 also has the advantage of providing a larger sample. Homes ownership is based on the ACS, and those in the country for 20 years arrived in 1993, 1994, or 1995. In the public-use ACS individual years of arrival are reported. 48 It is not possible to identify generations beyond the third with the CPS, so all those with two U.S.-born parents constitute the "third generation plus", regardless of where their grandparents were born. 49 The 2015 CPS shows that, of U.S.-born children under age 18 with an immigrant father, 59 percent are Hispanic. 50 See Brian Duncan and Stephen J. Trejo, "Ancestry versus Ethnicity: The Complexity and Selectivity of Mexican Identification in the United States", pp. 31-66 in Amelie F. Constant, Konstantinos Tatsiramos, and Klaus F. Zimmermann, eds., Ethnicity and Labor Market Outcomes (Research in Labor Economics, Volume 29). And Brian Duncan and Stephen J. Trejo, "Who Remains Mexican? Selective Ethnic Attrition and the Intergenerational Progress of Mexican Americans", pp. 285-320 in David Leal and Stephen Trejo, eds., Latinos and the Economy: Integration and Impact in Schools, Labor Markets, and Beyond, New York: Springer, 2011. 51 A modest share of the "third generation plus" are descendants of people living in Texas or the American Southwest when it was part of the Spanish Empire or Mexico. 52 The median earnings of foreign-born Hispanics is $24,217, or 66 percent that of non-Hispanic natives ($36,556); for second generation Hispanics it is $26,055 or 71 percent that of non-Hispanic natives; and it is $29,749, or 81 percent that of non-Hispanic natives for third-generation Hispanics. 53 The average age of adult second-generation Hispanics in the 2015 CPS is 34.1 years and for the third generation plus it is 41.1 years. This compares to the average age of 48.1 years for adult U.S.-born non-Hispanics. 54 In his work, Harvard economist George Borjas has emphasized that large initial differences in human capital among the immigrant generation can persist through into the next generations. See for example, George J. Borjas, "The Intergenerational Mobility of Immigrants", Journal of Labor Economics, 1993, and George Borjas, "Making It in America: Social Mobility in the Immigrant Population", National Bureau of Economic Research Working Paper 12088, 2006. See also Stephen J. Trejo, "Why Do Mexican Americans Earn Low Wages?" Journal of Political Economy, Vol. 105, No. 6, December 1997, and Gretchen Livingston and Joan R. Kahn, "An American Dream Unfulfilled: The Limited Mobility of Mexican Americans", Social Science Quarterly, Volume 83, Issue 4, December 2002. 55 As reported earlier in this study, 45 percent are on Medicaid or are uninsured based on the 2015 CPS alone. This is very similar to the 47 percent shown when using a combined sample of the 2014 and 2015 CPS.